I discovered Bridget though Instagram and it turns out we actually only live an hour away from one another. If you are in the market for a wonderfully restored home in the Durham area you are in luck because this one is for sale. I reached out to Bridget to see if she would be up for sharing her home with us all on the blog before the big move. 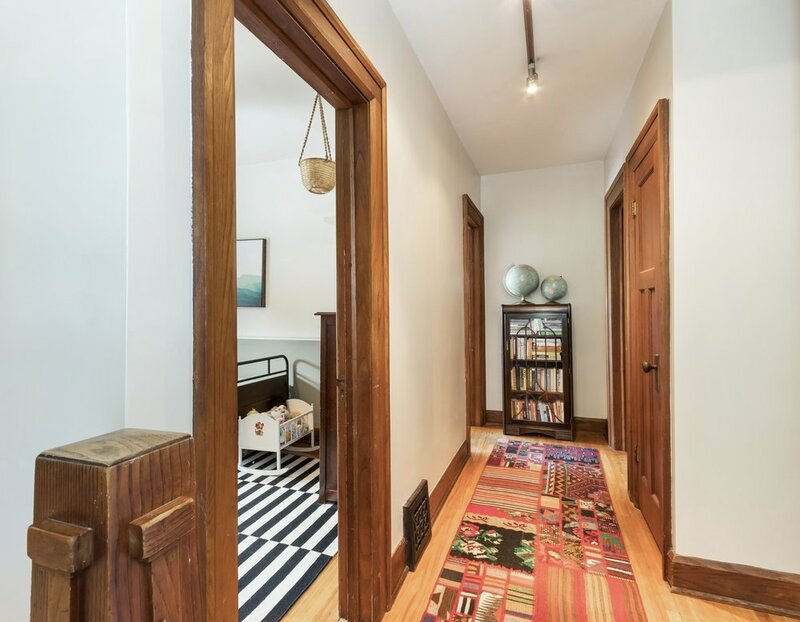 Her home features a ton of character and maintains its historic charm in so many ways while also including modern elements throughout. 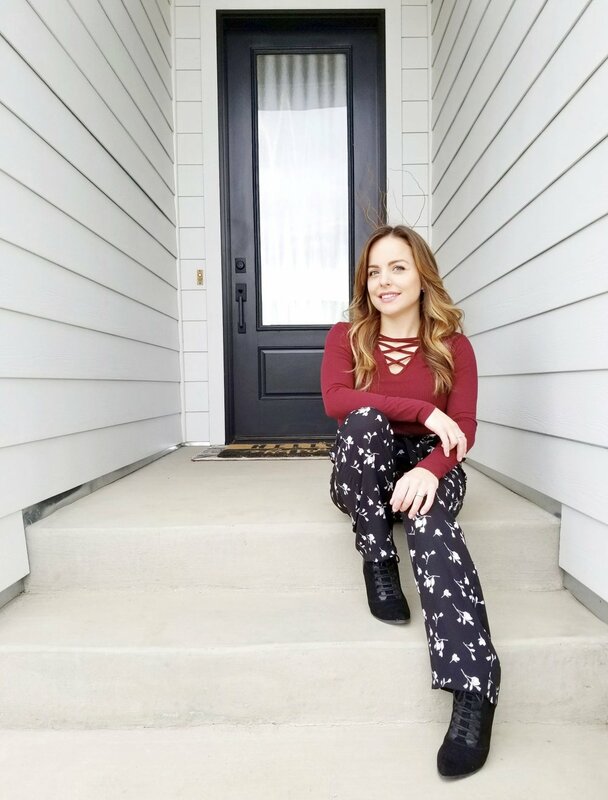 "My husband Josh and I, along with our now three year old daughter Frankie moved into this house just about two years ago. We were the only ones at the open house and loved the place right away! 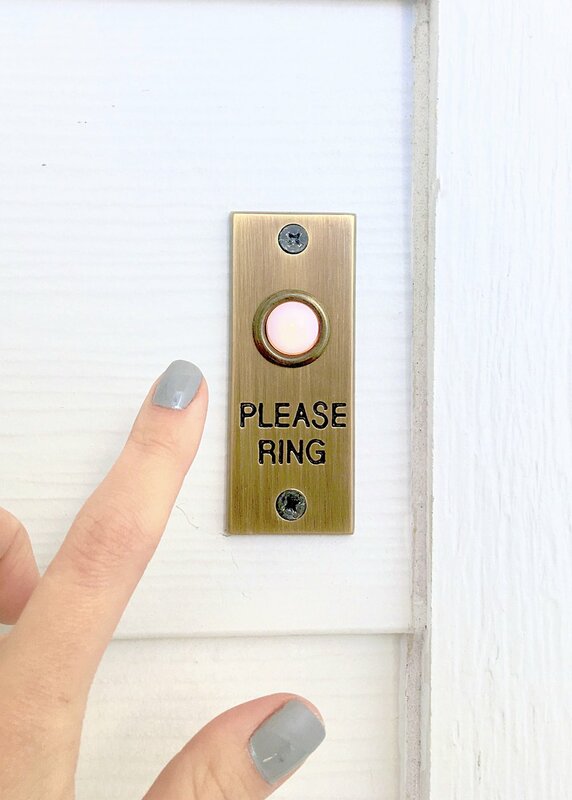 We pinched ourselves when our offer was accepted! The house was custom built in 1931 by a local Oshawa Architect for a Mr E.A Cooper. It reminded us of apartments we had lived in in Montreal (my hometown and where Josh and I met)." The family uses the large back entrance to store shoes and coats. A peek into my favourite room in the home. 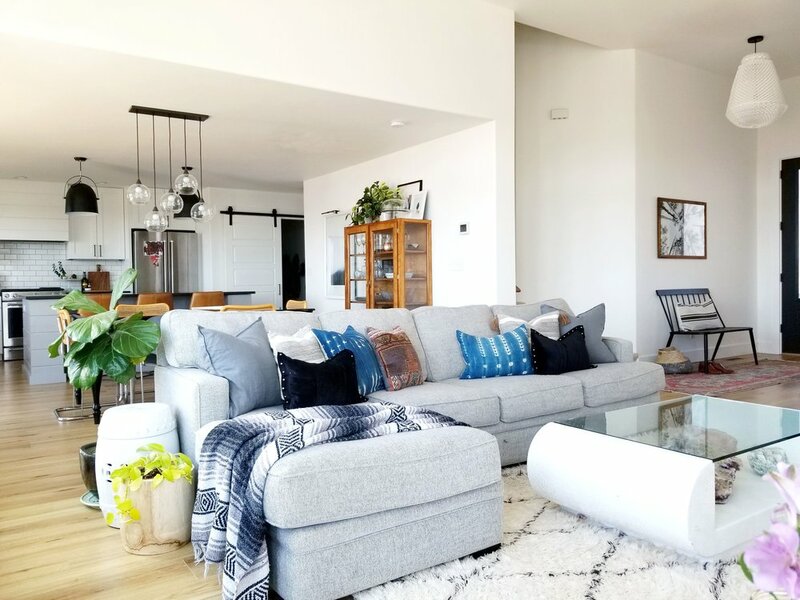 Bridget is not afraid to use color, and this blue works so well with all of the natural light flooding into the space. 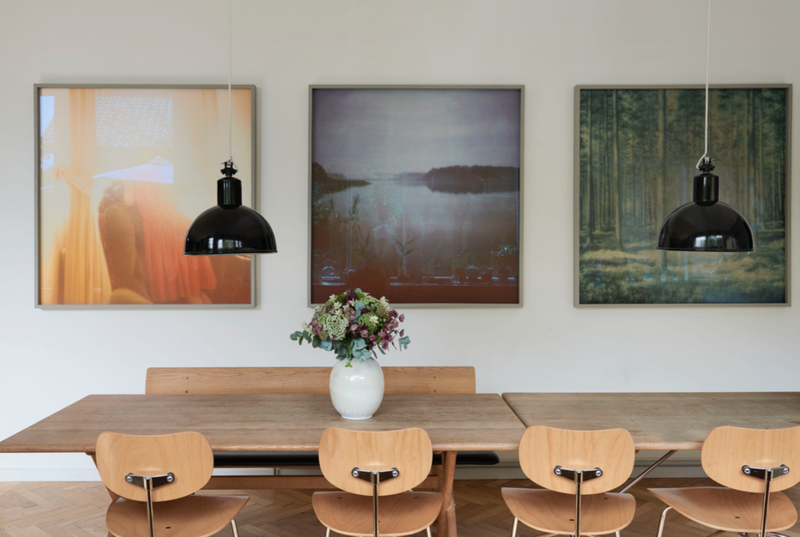 "My general approach to designing a family home is to surround yourself with things you love and that nothing should be too precious. Our coffee table (a mid century teak piece I found on kijiji) has ring marks from that glass of water (or bourbon) that didn't find a coaster, and the floor is scratched from Frankie dragging a chair across it while playing make believe. All these scars are a sign of a well loved and lived in home and I wouldn't trade them for the world!" In this shot you can also see the closed off foyer at the front of the house. How amazing is the gold detail on the base of the coffee table! The french doors allow the rooms to feel open for entertaining and when closed create an intimate space to enjoy a fire in the colder months. She has kept all of the original trim work natural where many people would have paint it white. 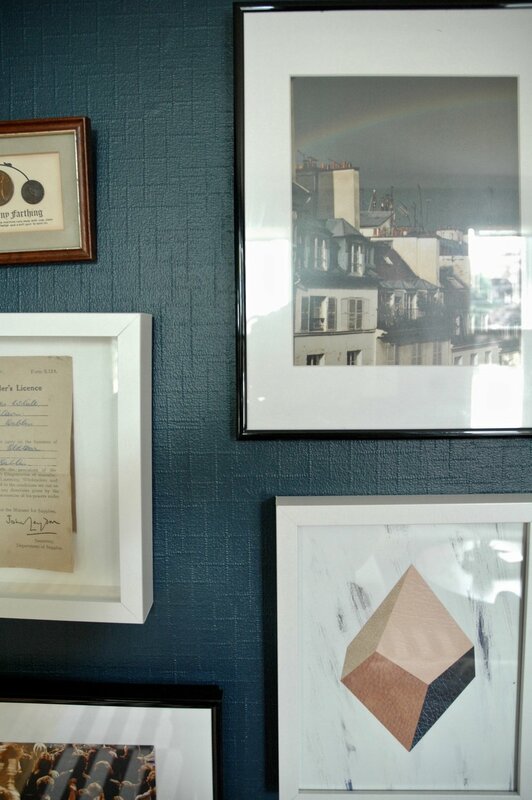 The mix of old and new proves to be the perfect combination in Bridget's home. 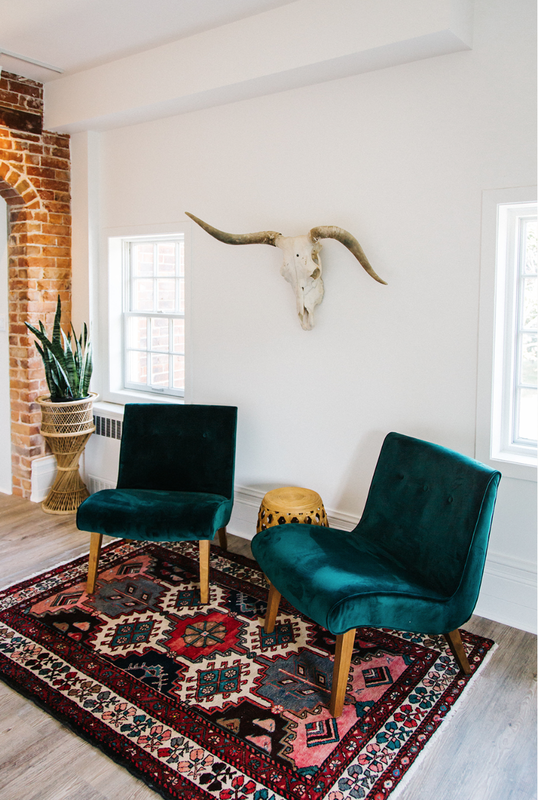 "I took cues from the age of the home when selecting finishes and paint colours and I feel like we achieved a good balance between modernizing the space, being true to its period and infusing our own style (a mix of vintage and modern with a well travelled feel)." I love a good gallery wall and Bridget has curated an eclectic mix of artwork in this corner of the living room. If you want to create a big impact this is an easy way to do so. Their vintage record collection is on display here as well. Rugs can easily enhance the aesthetic of a space. This graphic pattern works so well to define the seating area and add a playful element. A mix of modern and traditional styles are combined here with the solid wood table and airy brass pendant light. Who says you have to store fine china in the dining room? The families collection of books add an informal element and pop of color to the neutral walls. Plants are good for the soul and are such an easy way to bring life to a room. Bridget has used greenery in almost every space, layering plants into vignettes and styling shelves with decorative pots. 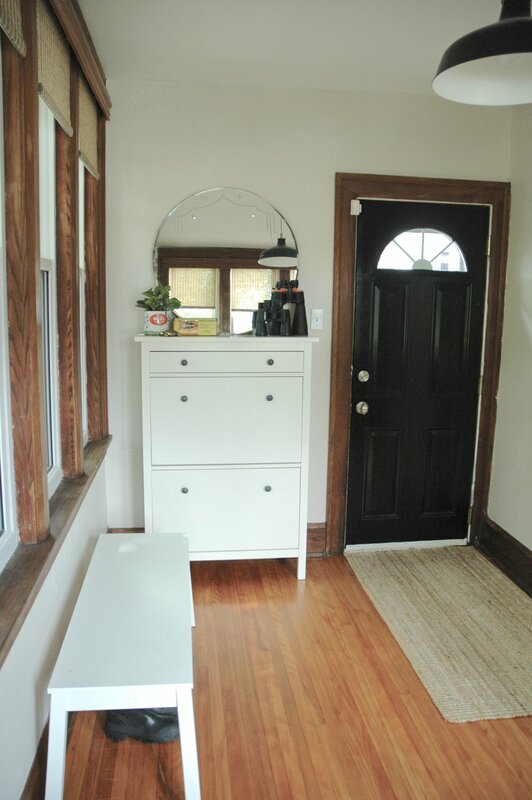 "We loved the creaky floors, original trim work and french doors. We didn't quite love the mirrored backsplash and honey oak cabinets previous owners had put in the kitchen! 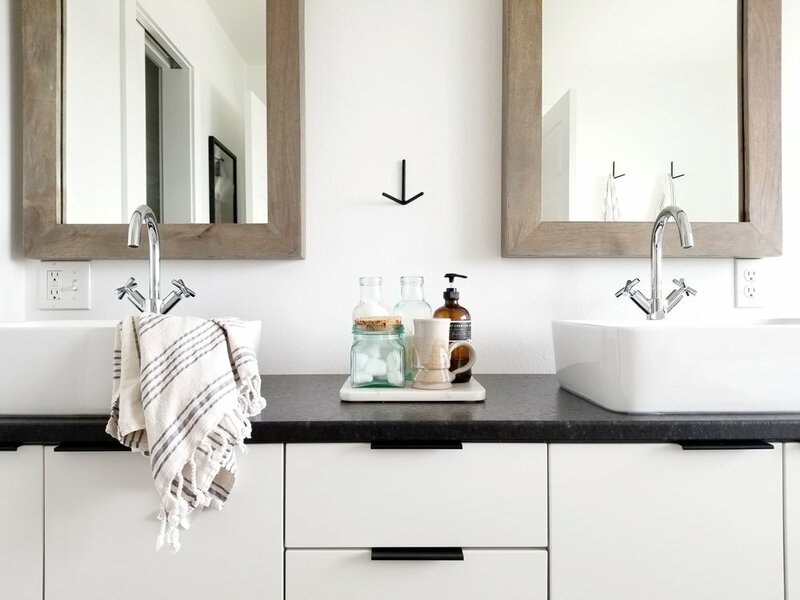 Updating the kitchen and adding a powder room on the main floor (where there was once just a small landing) were the two major renos we accomplished over the past two years." A view from the front entrance of the home. 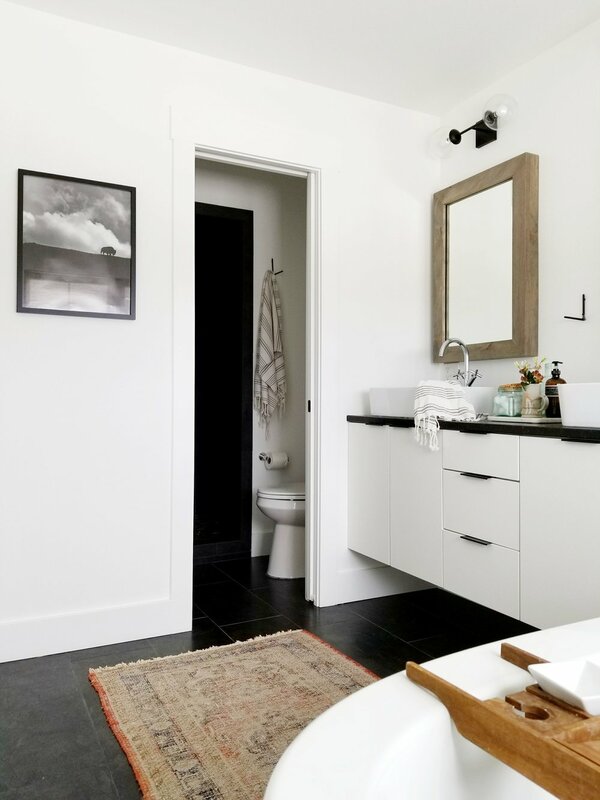 The small powder room on the main floor is classic in style. I have always wanted a vintage first aid kit, how fun is this Kelly green one. The spacious Master bedroom is a calm retreat. 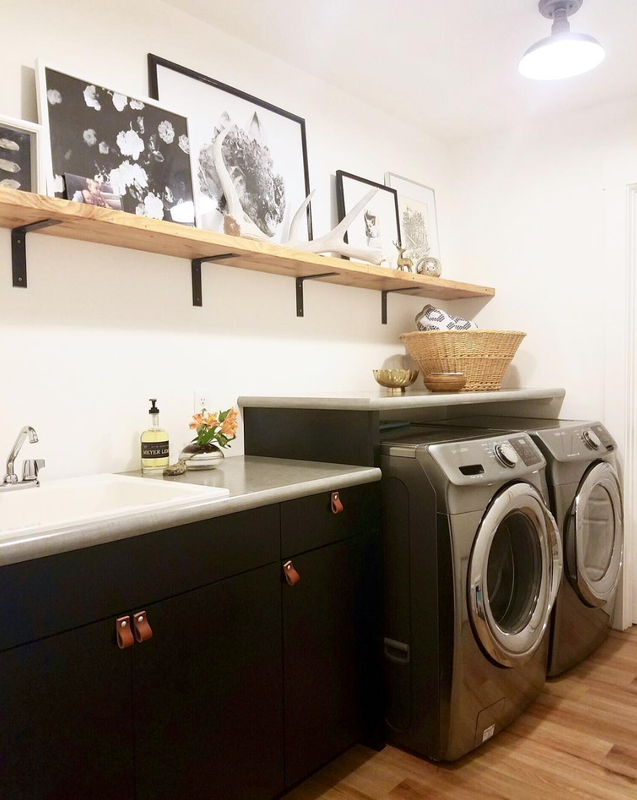 "Another eyesore we got rid of was a poorly thought out set of built in closets in our bedroom that were basically unusable. We ripped them out in favour of an open concept closet. We both really love how it turned out and how much easier our mornings are now!" Bridget runs her Interior Design business from her home office. She is passionate about creating functional, beautiful spaces for her clients, allowing them to enjoy the beauty in their everyday. When they moved in they found the original blue prints for the home in the basement and they now hang proudly in this space. 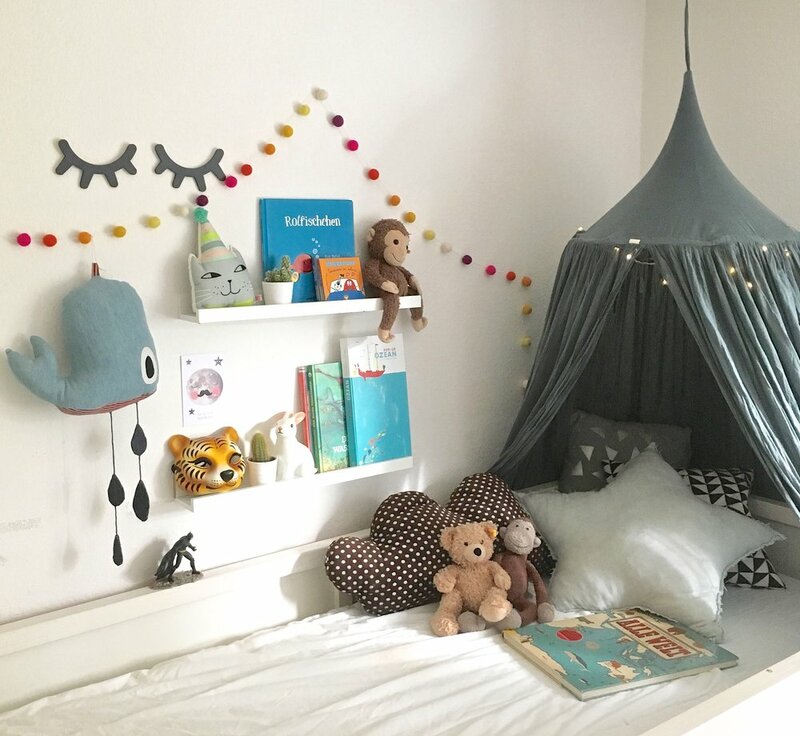 Her daughter Frankie's room is full of her favourite toys and books. A perfect spot to let her imagination run wild. "Leaving this place after all the love and sweat we have put into it is sad but I am also so thrilled about our move to Nova Scotia and the new home we get to make there. As the Irish author Cecelia Ahern said, "Home is not a Place, It's a Feeling" and my most favourite thing in the world to do is to make that feeling a reality. Both for myself and for my clients." I met Meg last year through Instagram. This photo captured my attention and I was curious to see what was behind the walls. It took a while to get it ready for the tour as they were finishing up some projects, but the time has arrived. Let's check out her wonderful space! "Our home is tiny at just under 1000 SF and it works for us. We try really hard to be minimalists - keeping only what we need and using everything we have. Our design and decorating philosophy is pretty strict - if it requires too much effort or too much time, it gets simplified." I am trying to become more of a minimalist myself, but still have a lot of collectables and thrift shop finds that require lots of dusting...which everyone knows is no fun. "My husband Tony is a graphic designer, I'm a commercial interior designer turned stay-at-home-mom (2 years ago), and we have three kids, Oscar-9, Penny-6, and Simon 3. 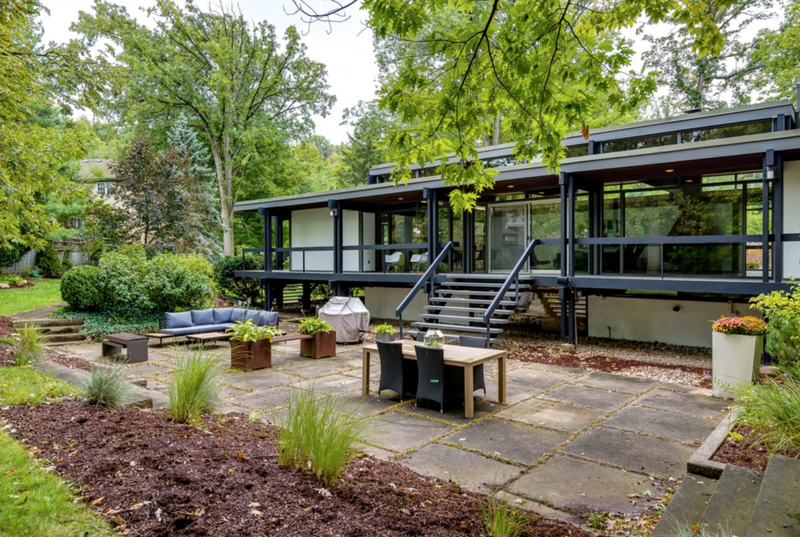 We live in Bloomington, Minnesota, which is a suburb of Minneapolis, in a 1950's ranch-style home which used to be Tony's grandma's! Although it's pretty unrecognizable to what it was when we moved in, his family gets a kick out of visiting and seeing the changes. I love that our home has history." 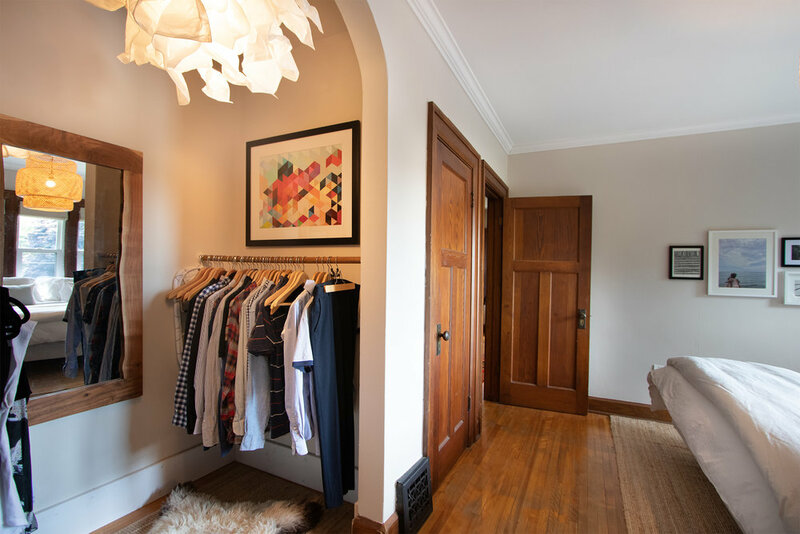 Living in a smaller space with three kids can be challenging, but the family puts storage to use in the entryway. An Ikea cabinet has been customized with a solid wood top & a wire basket collects shoes and sports equipment. 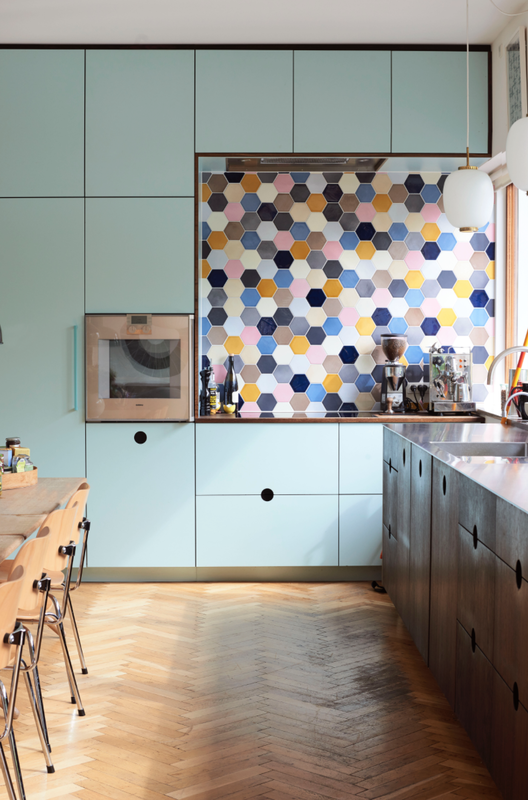 I love this bold pop of colour in the kitchen. The print is by artist Angela Hardison. Meg loves to cook and the family spends a lot of time hanging around this tulip dining table. The kids each have their own Stokke chair in red. If you are not familiar with this company you should check them out. The adjustable design ensures a comfortable and ergonomic seating position at any age. "I love the kitchen and spend most of my time here. It's set in the back of the house and has great natural light. 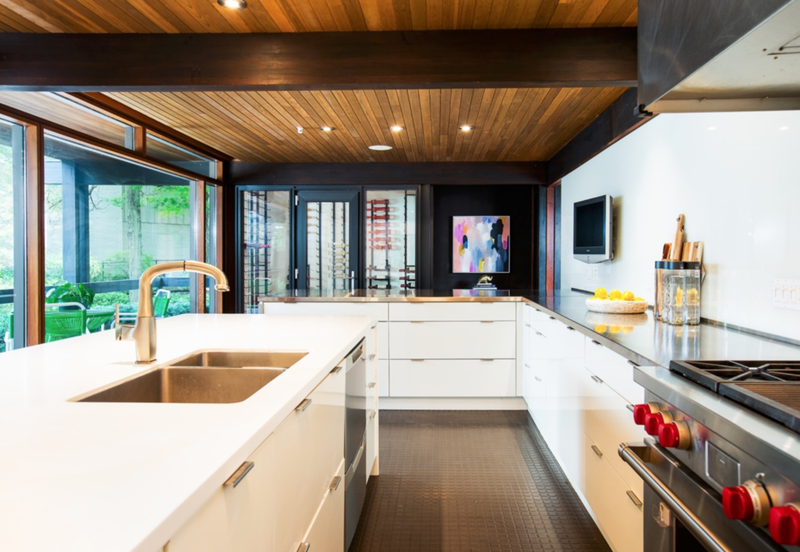 We remodelled the kitchen in 2008 and it's time for a refresh. We'll keep the basic layout the same so the changes are mostly cosmetic this time around. New appliances and cabinet fronts are being made." When I asked Meg if they were doing the renovations themselves I laughed out loud at her response. "Except for painting, we haven't done any of the work to our house. Outside of operating a drill, neither Tony or I are all that handy and have little patience for projects. Paying for contractors is a lot cheaper than paying for a divorce! ;) And a good contractor you trust is as good as gold!" 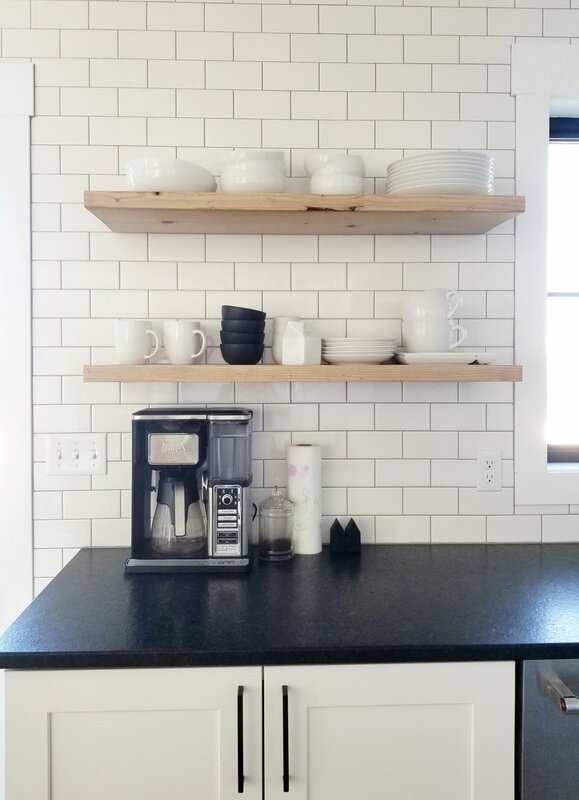 My husband and I renovated the kitchen in our first home years ago before we had kids and it definitely was a time consuming process. We didn't have to seek couples therapy afterwards so I guess thats a good thing! Whenever a family member celebrates a Birthday these white lanterns are strung up. A simple and modern idea for kids or adults. Yum...cake! I noticed that this art piece on the wall here was always changing in Meg's IG feed. I asked her how it worked and here are the details. "The photo wall is made up of a product called Photo Curator by the Curator Company. I bought them nearly 10 years ago on FAB, when that was still THE way to shop for design goods! (I miss them). I have 45 sets and each set holds one 4x6 photo. There are little clips in the corners. Tony usually designs the layout and we get the photos printed at Costco. We can change out the wall for under $10! It's such a fun thing in our house! We change them out at every birthday and they also hold 4x6 index cards so once in a while the kids will create art on each card." "This is the room we live in. We eat here, watch TV, read, build trains, do homework, play, you name it. Our furniture is kid friendly and easy to clean." The streamlined designs are high off of the ground allowing your eye to travel through them. With the use of light weight pieces the family can easily move them around if the kids need the rug to play on. 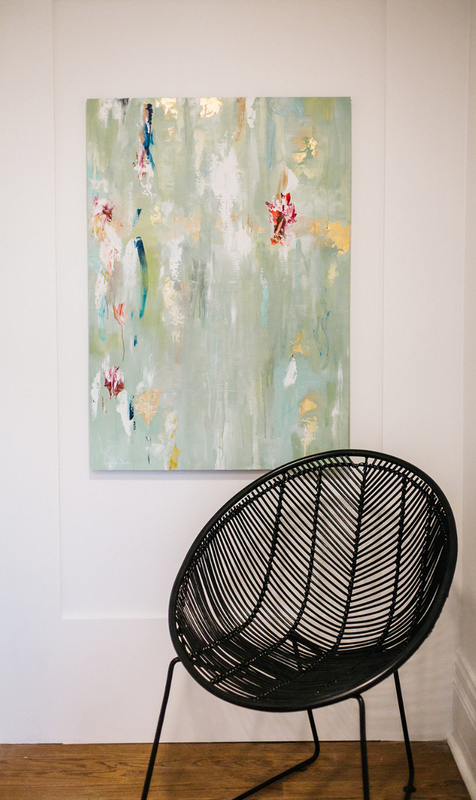 With select pieces in the living room they chose to splurge on this iconic Womb Chair. I love the soft grey fabric & bet that they take turns sitting here to watch TV. Meg commissioned her son Oscar to create the artwork on the wall and draw out the names of each family member. 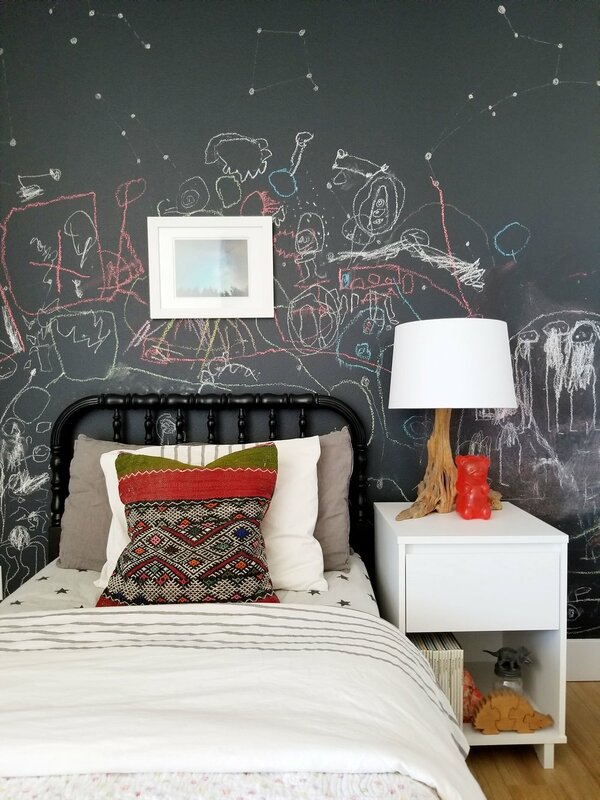 I love adding kids art to my own home, it's such a personal and inexpensive way to decorate. "When we did our first remodel in the kitchen in 2008, we chose to keep the kitchen separate from the living/dining area as opposed to a more open floor plan which is popular in ranch home remodels here. Living in such a small home with five people, it's nice to have some separation of space." Lots of hidden storage in the drawers and cupboards in this room. Meg's son made this parrot hat at art school. They loved it so much they framed it and display it proudly in the heart of the home. "Our bedroom doubles as Tony's work space. He designs almost every night after the kids go down so we've worked hard at accommodating what he needs to work and what I need to sleep!" I looked up Tony's website and guys he just designed that red N that pops up on your Netflix home page... I had to tell my husband I was very excited! Tony's art is hung throughout the home. 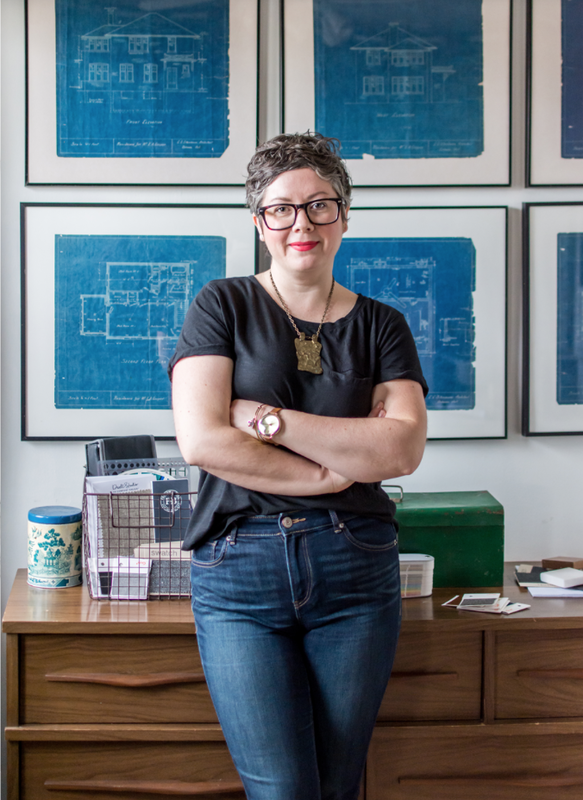 "I believe in simplicity, clarity, and the importance of all design disciplines." "We added additional lighting controls in our bedroom to support work and sleep and it works really well. We keep our room stripped of anything extra to help it feeling open and light." "Our boys share a bedroom. One is very tidy and the other is very...not tidy. I help the messy one clean up almost daily to keep the peace! I think adding a bedroom in the basement might be in our future!" I love this vintage lamp. I think my girls need similar storage for Lego. Meg has a small workplace with the best gallery wall featuring Larry David...it makes me smile. 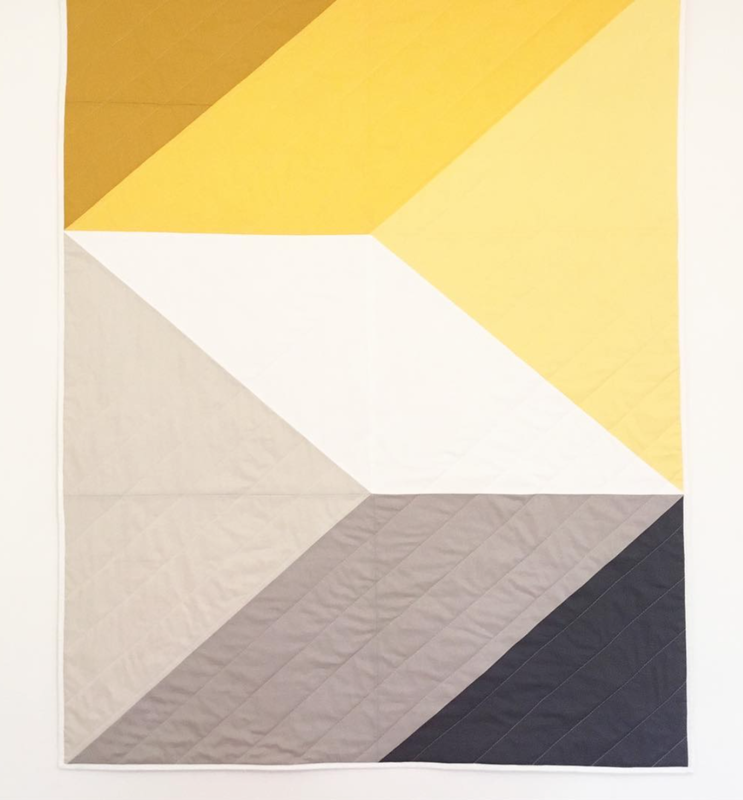 A few years ago she taught herself how to make simple and modern quilts. The geometric pattern and colours on this piece really caught my eye. "Penny has the best room in the house! It's super small, has a huge window, and is located in the heart of our house." What girl wouldn't adore this space? She's got her own art collection started and a small desk to sit and draw. "Last year for her birthday, we surprised her by converting her weird, unused closet into a hideaway for her. The closet sits up a couple feet because it's over the stairs to the basement but it's the perfect size for her to read, color, draw, or get away from her brothers. As our only introverted child, it functions perfectly for her." "Though our house may be tiny, our back yard is huge for a city lot. We added a slatted wooden fence this summer and it's easily becoming our favorite place to be in the warm months. Our kids really enjoy being outside any time of the year so I'm especially thankful we have a place for them to be." I want to thank Meg for sharing her home with me. I think it is wonderful that her kids will grow up in a home that has such meaning and family history. Good luck on your kitchen transformation, can't wait to see it! I recently discovered Lora's company on Instagram & fell in love with their designs. The products they make are sprinkled throughout her home & add a ton of personality. "If I had to describe my style I guess it would be vintage surf cowboy, because I love things that are earthy and natural but also really love quirky sparkly things. I come from a fashion background but have always been a maker and DIY-er. I started Sun + Stars in the winter of 2015 with my friend and business partner Kristen McGregor." 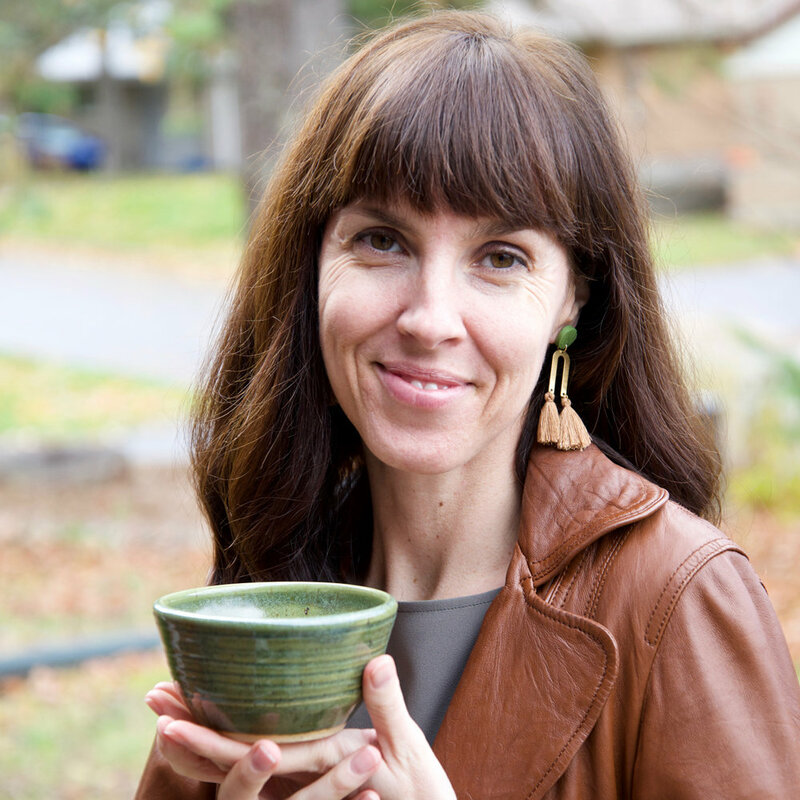 "My husband and I bought our house in the Junction area of Toronto with my sister in 2011. It's split into two apartments. Our family is on the top two floors, they are on the bottom two and we share the outside spaces. It's a nice way to live in the city (more) affordably, plus we have less house to clean and have a built in dog sitter when we go away! Our portion of the house is about 1400 square feet. Sometimes we dream about moving to the country and having a big studio and wide open spaces, but we've lived in the city so long that I think we might miss the convenience of walking everywhere. Plus we have a really great community around us, it would be hard to walk away from it." 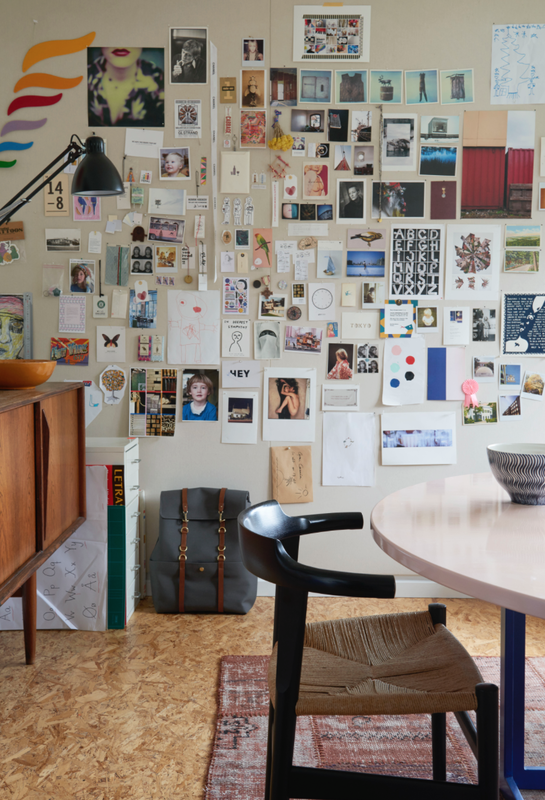 Now let's dive into these photos and see her creative space! This is a corner of the living room. It's filled with colour, art & music...some of my favourite things. Lora's sister got the girls the yellow record player in Nashville. "They love playing Mini Pops and Blondie records while they play lego." A few records from their collection. "I'm really inspired by vintage kids books and art prints. I've always been drawn to vintage and have been thrifting and flea market shopping my whole life, some of my favourite pieces of furniture or clothing are things I've owned for years." 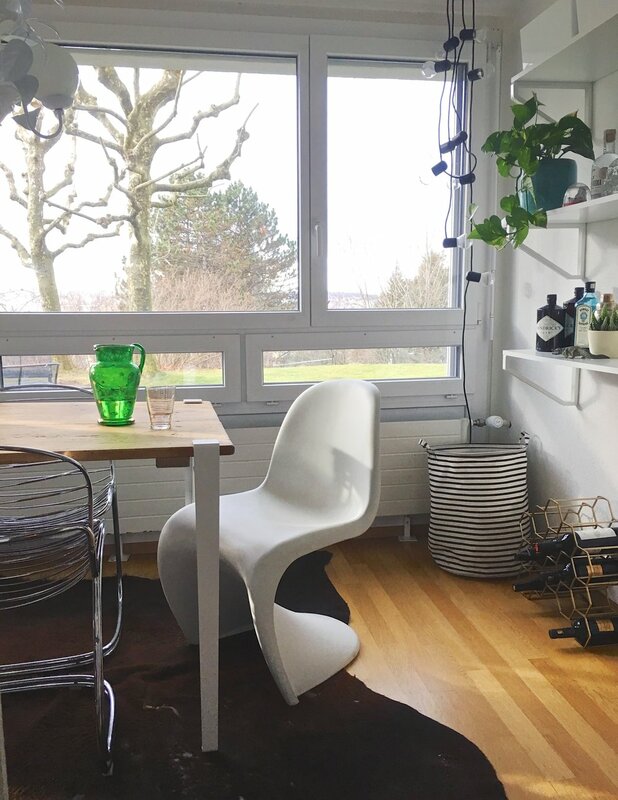 "I used to be a big collector, but now too many things in a room create a visual noise that makes it hard for me to relax, plus living in the city space is at a premium so if I don't love it or use it, it goes! Our living room is our all purpose room, this room is rarely empty. We got that big sectional couch from West Elm because each piece is the size of a twin bed so it can double as a guest room when needed. The teak coffee table lived in my house when I was a kid and it's the most useful piece of furniture." "The kitchen is the room we've done the least changes to other than adding some cupboards and lots of white paint. We're planning on re-doing the backsplash this fall. We do everything in this room, eat, dance, make art." Using vintage maps is an inexpensive way to fill your walls & add colour to your space. "In the warm weather we always have the sliding doors wide open to the deck. We eat out there and hang out and there are stairs down to the main back yard." My favourite colour is turquoise...how great are these painted stairs! I think we all need a pair of these pillows on our bed. "Our room is pretty minimal. My life and house are loud and messy, I need my bedroom to be a place that is calm. 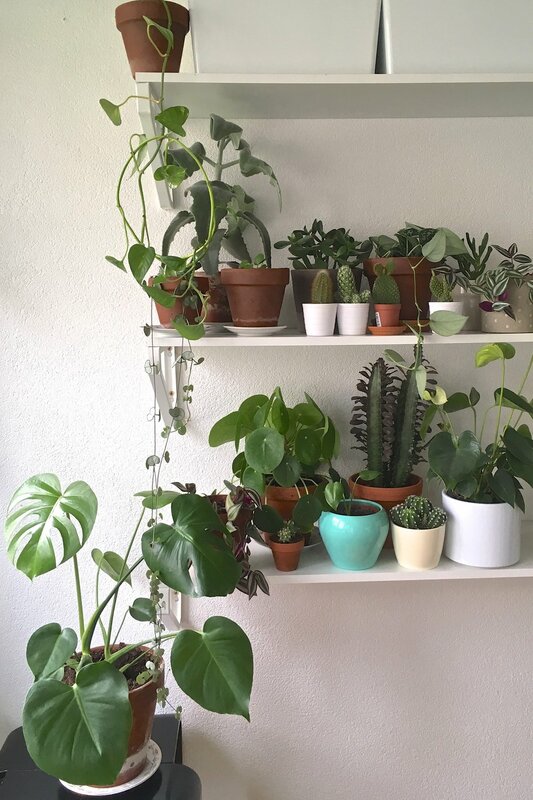 Most of my collections are capped at 3-5 pieces, except for my plant collection, I tend to fall in love on sight with plants and bring them home with me." I love the natural light in here, don't we all wish we had a few sky lights? How amazing are the hand made eye pillows Lora made. "The embroidered curtains are panels from a dress that my husband's mom wore when they lived in Mexico (when he was a kid)." Years ago Lora purchased this print online of grasslands from National Geographic. It was enlarged & now hangs in the bathroom. A private space to escape & enjoy a morning coffee. 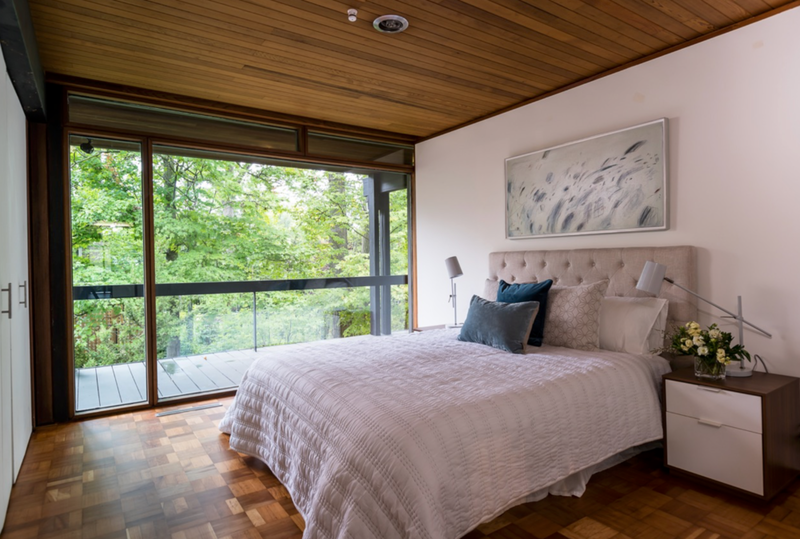 "Looking out onto our little upstairs deck from bed is another of my favourite things. For a house in the city we are surrounded by trees, you can't look out a window without seeing trees. It almost feels like we live in a tree house." Lora's studio is at the top of the staircase. 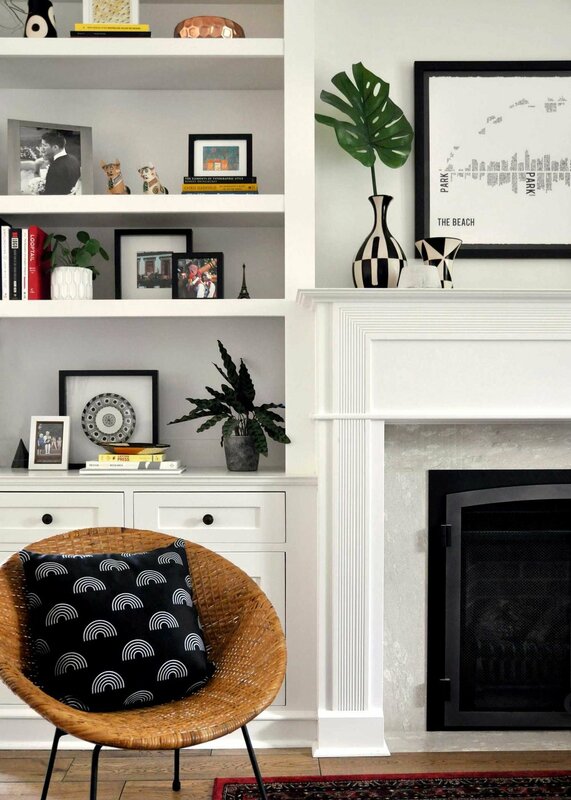 A framed print of a Bald Eagle as well as lots of greenery add warmth to this corner of the home. "I spend ALOT of time in here, working and listening to music. It really is my happy place. We work on new designs and patterns, cut fabric, silk screen and sew in this room. My husband is an animation compositor and he he often works at night too. I've always found mornings and nights to be great times to work on projects, if you manage to get that second wind!" I love seeing where other makers find inspiration and their creative outlets. 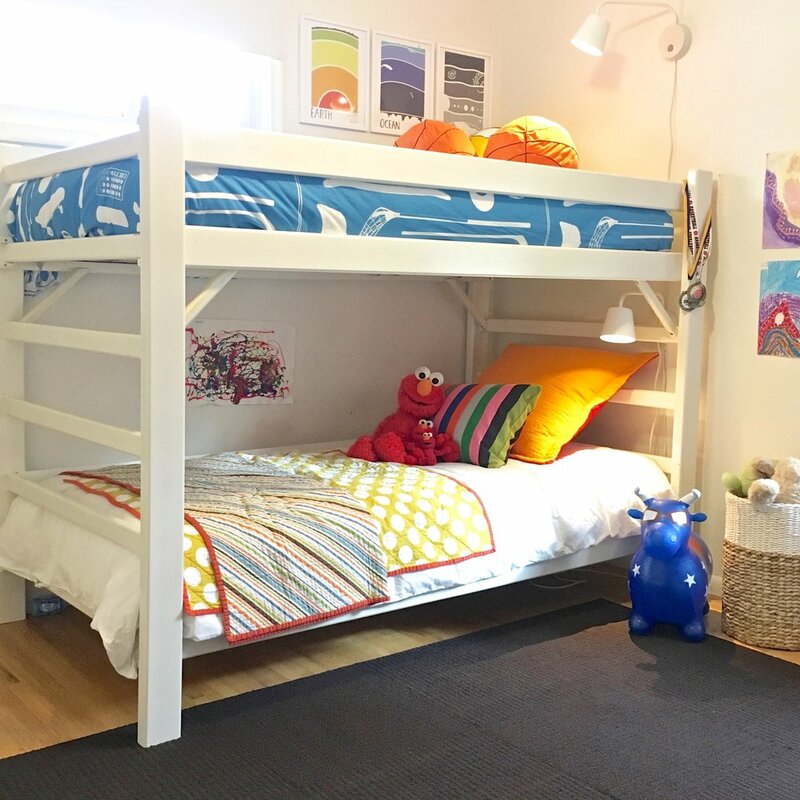 "Together we aim to design items that appeal to both kids and their parents; Pieces that add imagination to a child's bedroom or look playful in a living room. We believe in quality goods made from sustainable materials that will live in your home for years to come." The pink door leads to the girls bedroom. "We have three rooms on the second floor of our house. Right now one is used as a studio so the kids share." Vintage rattan hooks hold the girls dress up costumes & purses. I think the exposed brick is such a great feature, I'm glad they didn't paint it. One of my favourite elements in this room is the eclectic vibe created by mixing vintage textiles & patterns. I feel like a boring mom as my daughters only have 2 sets of sheets & one duvet cover. Unless I do a complete makeover things always look the same. 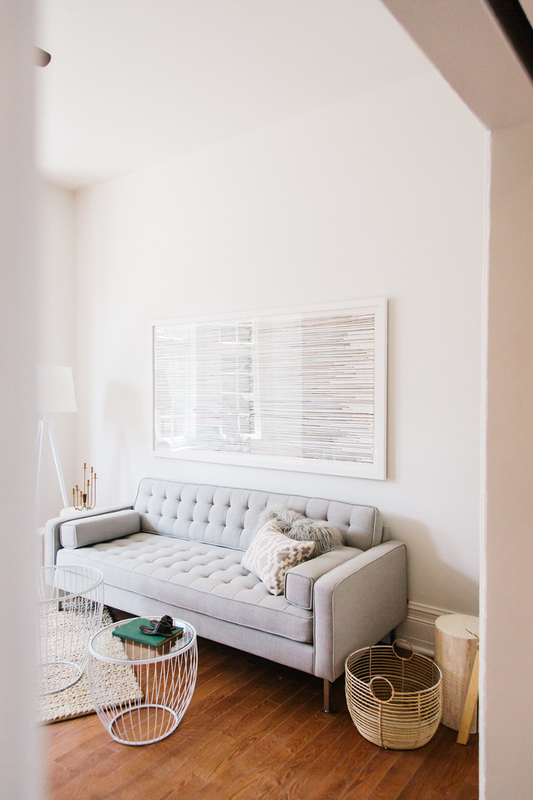 "This is probably one of my favourite rooms in the house, it's so filled with light. My kids love jumping on beds and also often fall out of bed while sleeping so we keep them low to the ground. We made the window seat and the "cave" bed in separate DIY projects." 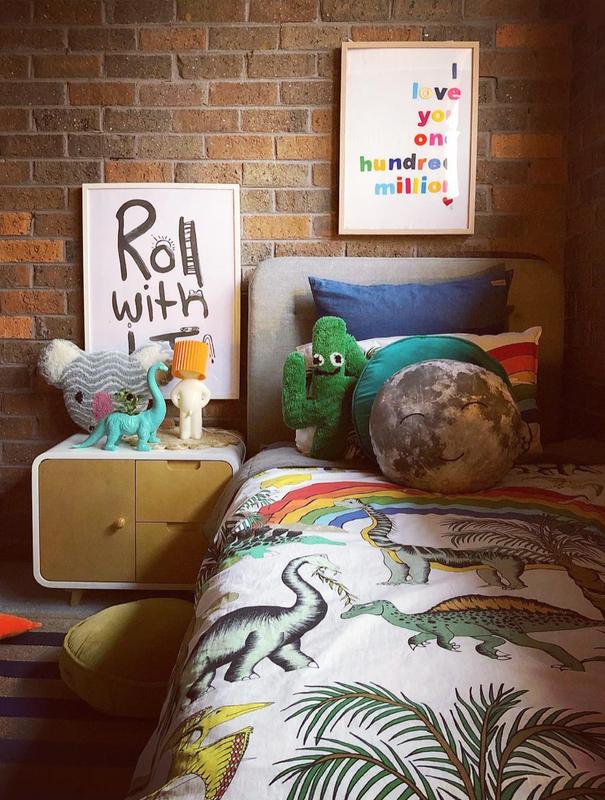 Vintage textiles add so much colour & personality to the kids room. Lora has painted the ceiling a pale blue which allows the girls artwork & Lora's designs to pop against the white walls. How cute is this! They are coming out with a new design for fall of a Blue Jay, all you Canadian readers check it out. I want to thank Lora for sharing her home with me, & since we are only a few hours away I think my daughters & I should stop by before the snow falls for some fun in the big city! 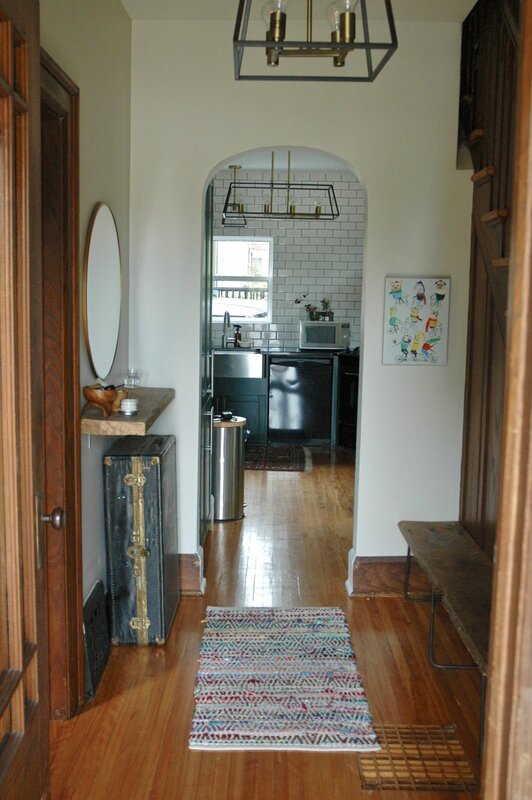 The photo below was taken in February of last year for our Apartment Therapy house tour. I grouped a collection of my favourite artwork together when we moved in 3 years ago & hung it in the living room on the main wall. All of the pieces were placed no higher than eye level & I was happy with how it looked. This is the first wall you see when you enter our home, after leaving the foyer. Fast forward to this past Christmas when our daughters received an aquarium. It's large & we really had no space on the main level in our bungalow to put it. I've had the vintage teak coffee table for years, and it seemed like the only spot for it to sit. There are drawers on either end that are really deep, one side never opens as it would hit the wall. The other side houses lots of puzzles. The only thing that usually sits on top is the blue lacquered West Elm tray filled with kids books. Sometimes the girls would sit & colour here but we definitely could do without the surface area. A week before school finished I decided to give the gallery wall a makeover. It was a rainy day, so I had the pot lights on. That 2 outlet power bar is no longer there, which makes me happy. The wicker basket sits behind our rope chair & also holds more kid's books. When I hang a gallery wall, I eyeball the entire thing, no measuring for me. The only thing on the wall in this shot is the first aid box that belonged to my father-in-law. It's screwed in so it wasn't going anywhere, all of the other frames aren't too heavy & a nail is all I used. I think some of the walls in our home are plaster, you really have to hammer the nails in with all your might to get them into the wall. I hung the largest piece first above the aquarium, a photo from my friend Meg at September Wren. I also have 3 other prints of hers on the wall. The wooden piece on the left eventually got switched as it was too tight against the wall. A few pieces are signed prints I've thrifted, while others are photographs I've taken or purchased while on holiday. My husband enlarged an old photo of my grand parents for me which I love. I started on one side of the wall & worked my way across, trying to vary the frame colours & style of artwork. The red piece on the bottom is an illustration from "Stranger Things" my husband bought that one. I love the turquoise palette in the canvas (pool scene) by my friend Laura Browning. She graciously sent this to me after I featured her lovely home on the blog. Two of my resin pieces are displayed. Pink clouds is from my Daydream series. Stay tuned I'm going to have a summer sale on what stock I have left. If you subscribe to my newsletter you'll be the first to know. The other mini block is resting on top of a frame since it's so lightweight. A polaroid of my daughters is sitting on a frame on the far left. I like an eclectic mix & this makes it less formal in my opinion. We got a beach photo from our trip to California printed in a fun shade of blue by Parabo Press. I took the shot of the Zebras on the same holiday at Hearst Castle. My youngest daughter was so excited when she saw it up. It's tricky to photograph this wall on an angle as the opposite wall is all windows. I think you get an idea of what it looks like all complete. My friend was over a few weeks ago & said she couldn't help but stare at it. It's a conversation starter for sure. It tells a story of the travels & memories that are special to me and my family. 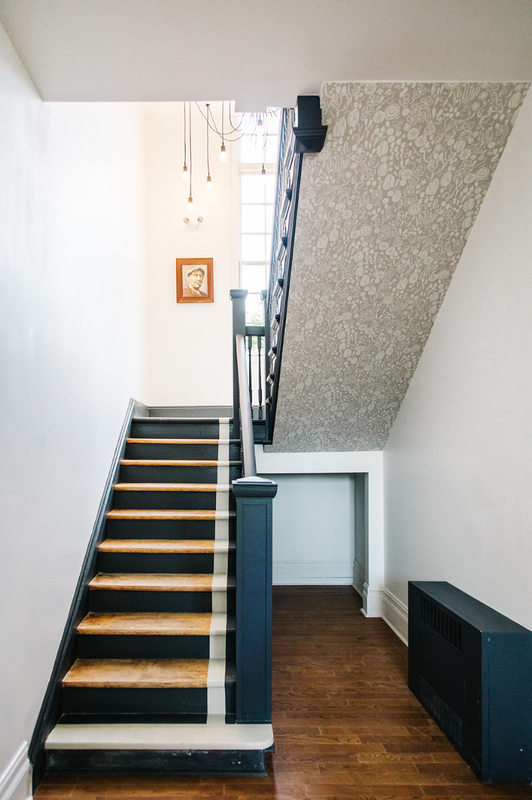 Leading to our basement we have a large gallery wall on both sides of the staircase that is made up of family photos. If you have pieces you love, display them in your home! I always think it's strange when I go somewhere & there is no artwork on the walls. Maybe that's because I'm an artist, I like to surround myself with it daily. I discovered Lauren through Instagram & reached out to her to see if she would be up for sharing her home with us all on the blog. A few months later, here we are! 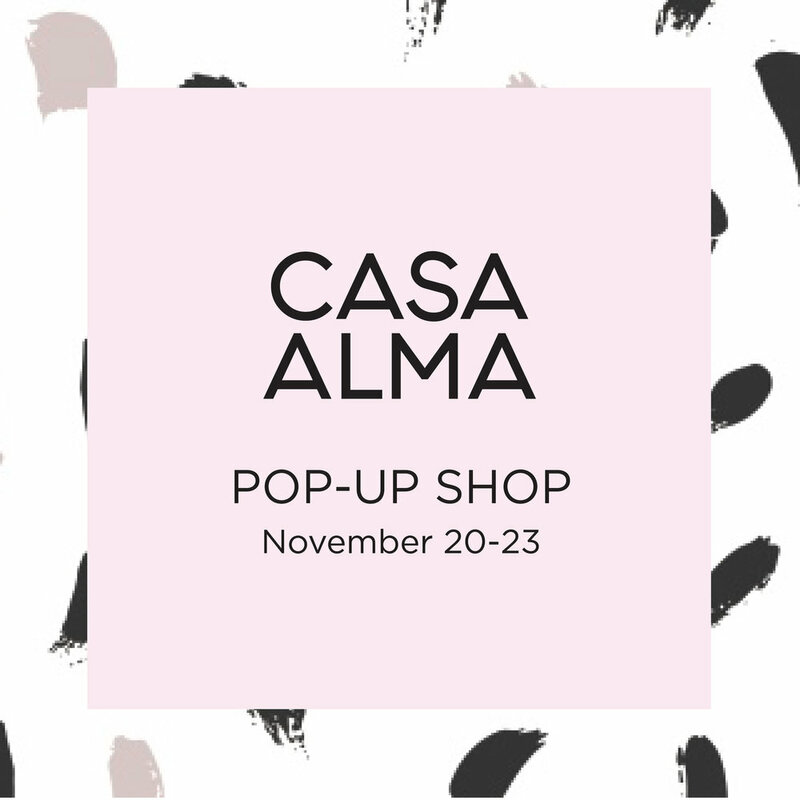 Get ready to see a wonderful space that has been carefully curated. Her dog Acorn is ready for the tour! "I am certified in interior design and as of now I help friends and family style their homes. I am working on moving forward with an interior design business. My husband and I live in Wilmington, NC with our 3 rescue dogs; Noah, Elvis, and Acorn. In addition to sprucing up our home and interior design, we own a video production company. We work from the Tin Roof (our home) so it can be difficult to concentrate while thinking of all the things I could be rearranging and adjusting around the house. Hah!" I also have a studio space where I paint in our home so I can totally relate to what Lauren is talking about. Even though the entrance is small, Lauren has given it so much personality. 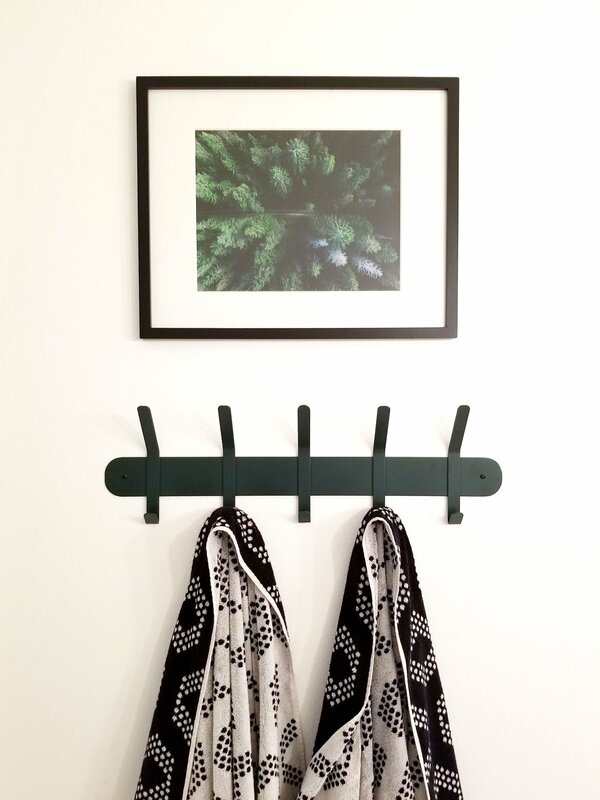 The addition of agate drawer knobs on the wall create a spot to hang your coat or purse. 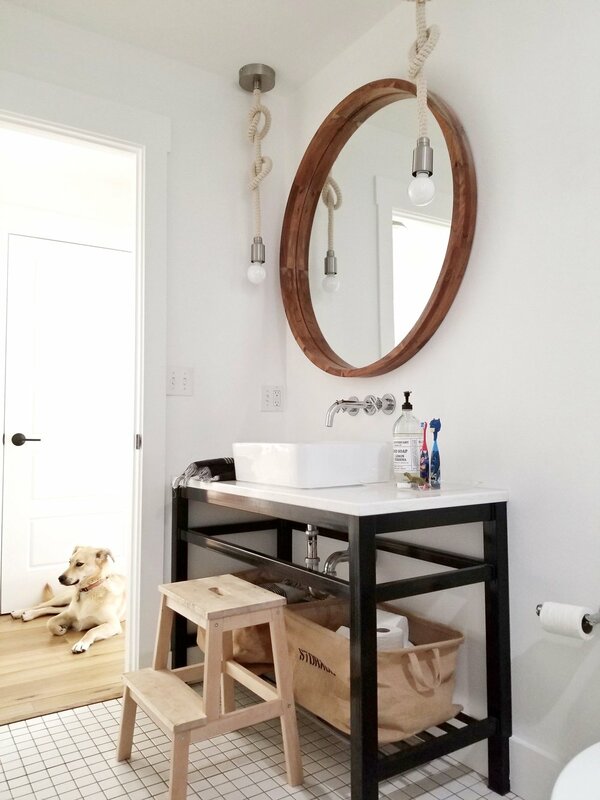 Lauren's Uncle made the wooden console & the mirror from Home Goods is the perfect focal point. 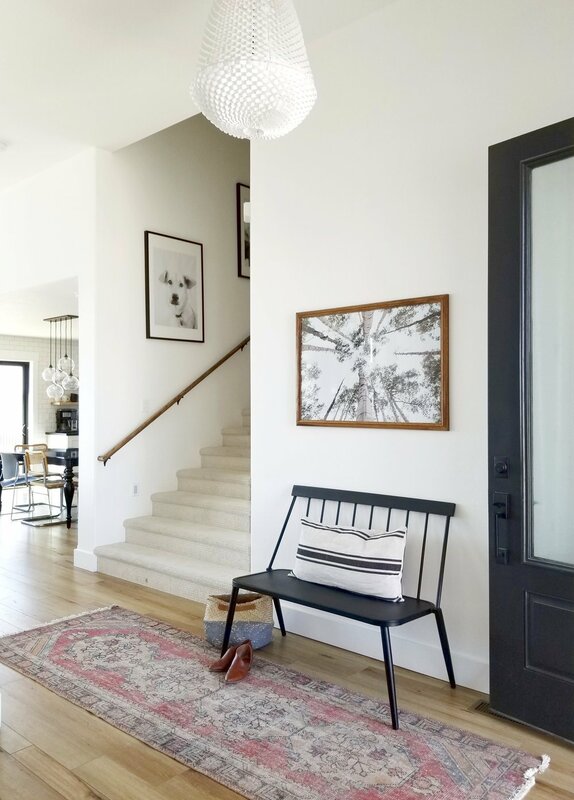 The main living space is an open floor plan & can be seen from many angles, keeping things simple & uncluttered in the foyer helps with the flow. 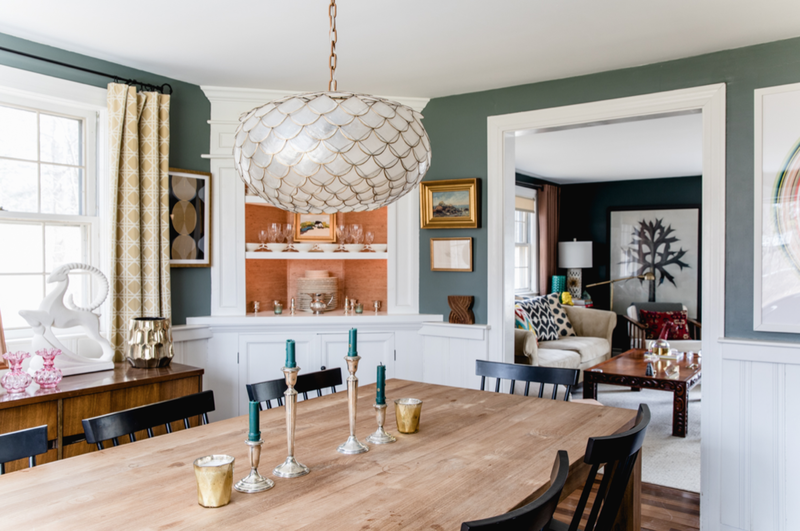 A pop of colour is added in the dining room with the addition of a bench. I love the oversized cacti print. 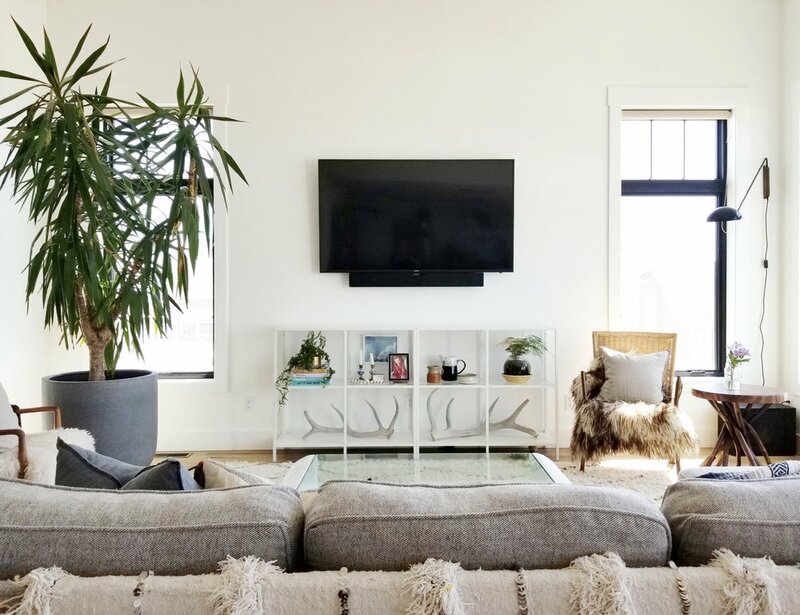 "From southwestern flare to Persian rugs, I am truly inspired by all types of design and I love to sprinkle a little bit of everything throughout the entire home." "The grandfather clock was my grandparents. It was made in 1816. We just recently got it working again. You can here it tic tock throughout the house...It's pretty special!" 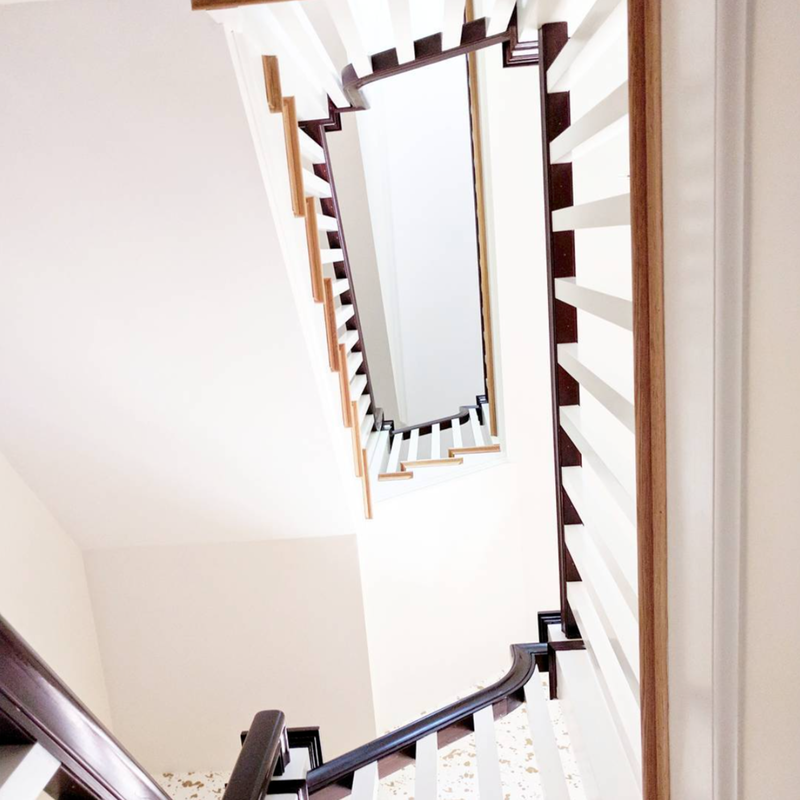 Lauren & her husband were lucky to find a home that didn't require any major renovations. The previous homeowners did a fantastic job on the kitchen. Considering that they only moved into their house last August, Lauren has done an incredible job making it feel like a home. 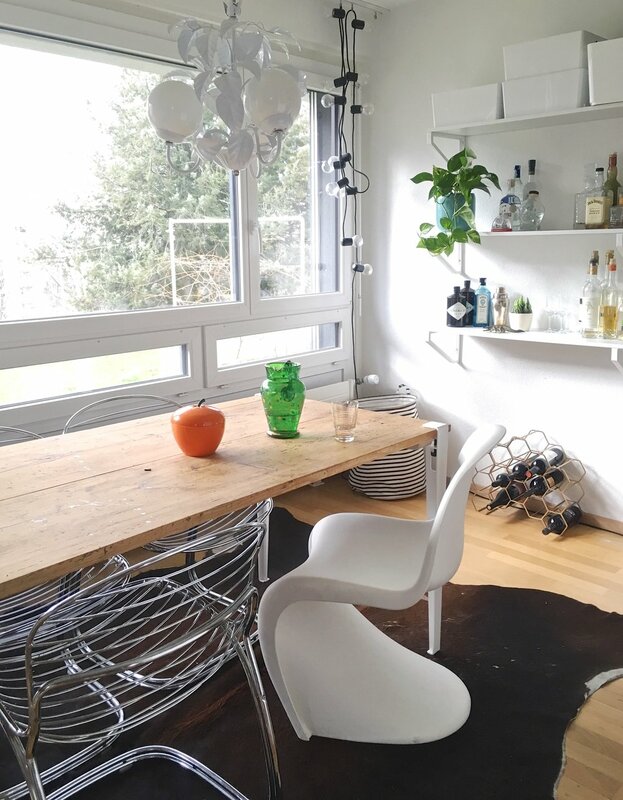 "We love our little eclectic home. It is surrounded by palm trees, succulents and beautiful foliage. We are a couple miles from the beach, so it is nice to step outside and smell the salty air. Our outdoor space with the sunroom, back deck and pool, is the perfect little oasis to entertain friends and family! And of course, let our 3 pups run around and play." This shot allows you to see the open floor plan. I'm so jealous that they can cook & watch tv at the same time! When they moved in they repainted and changed the light fixtures & blinds. 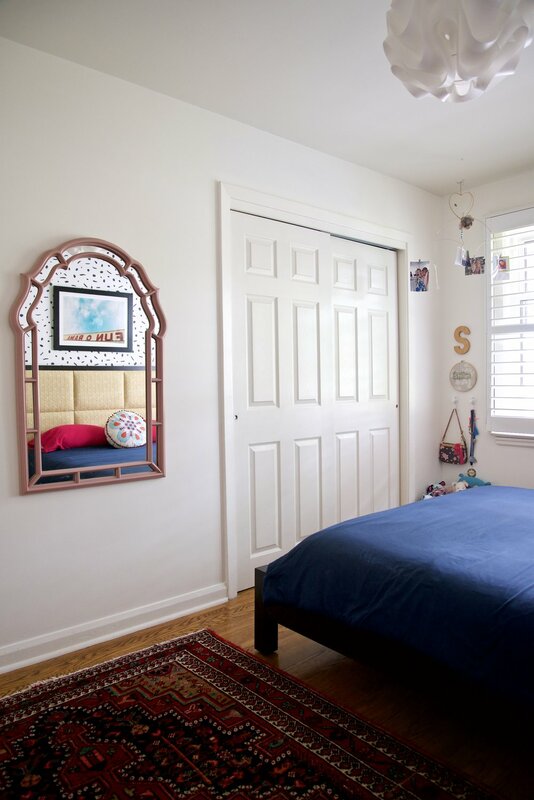 Easy fixes for anyone who wants to add their own personality to a space. Lots of comfy cushions create a welcoming spot to cuddle. "The record player was my father in laws and he generously gave it to us when we moved in. We have a ton of great records but my favorite is Fleetwood Mac for sure!" I also listen to a lot of Fleetwood Mac in our home, so I think we would hit it off. She has good taste folks. 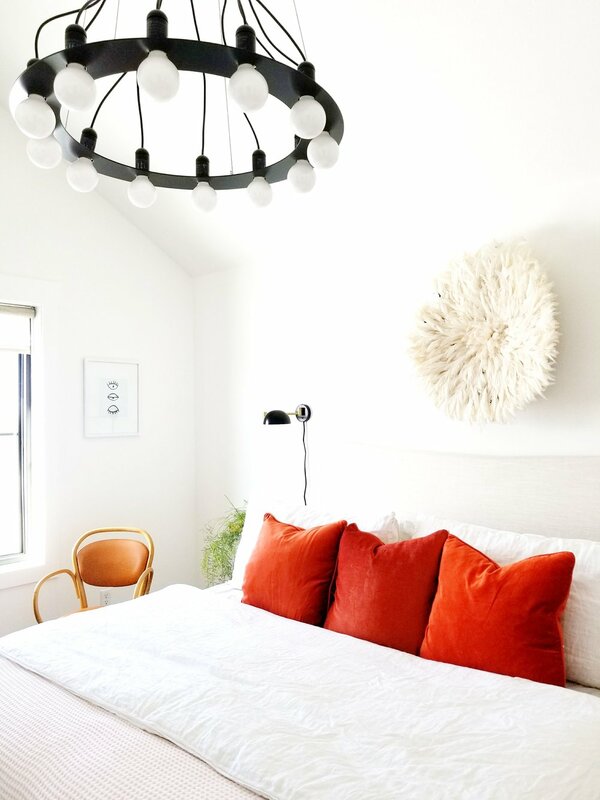 The master bedroom is kept neutral with lots of texture. How stunning is this bed from Anthropology! The perfect spot for guests to relax and spend the night. "My favorite room in the house is the living room. The room has large bay windows that bring in a ton of morning light. We love to sit in there each morning, drink our coffee, chat and hang with the pups. It's a great way to start the day." I love how Lauren has incorporated plants into the vignettes throughout her home. They really are an inexpensive element that adds a lot of character. Our living room area rug is very similar to this pattern (my husband even noticed that) good choice Lauren! No corner is left untouched. 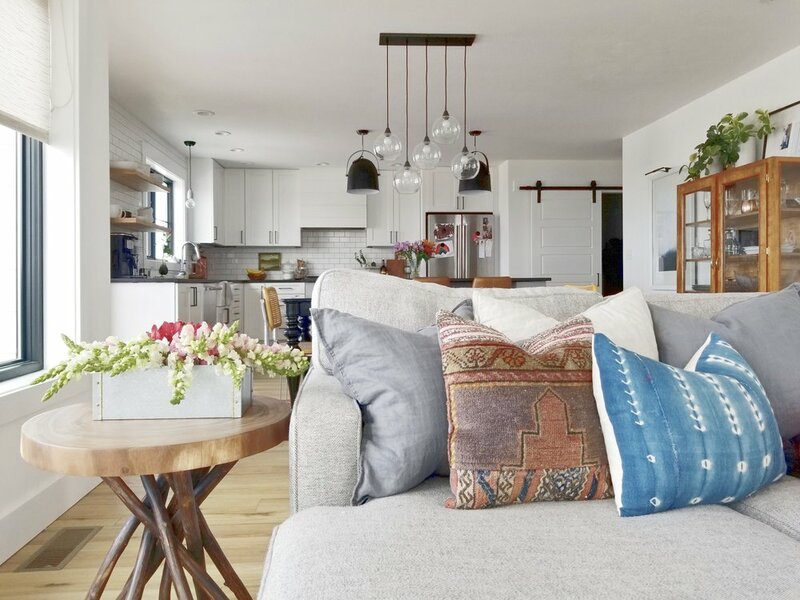 Lauren has styled every inch of this home to perfection. "I will forever love interior design and helping others turns their house into a home. It’s definitely my passion." Thanks for sharing your home with us Lauren, & I know you are going to succeed with your new business. When I first joined social media I was surprised to see how many other people shared my love of thrifting. I remember a piece of art that caught my eye in Jo's space & it turns out it is her favourite element that welcomes you into her home. 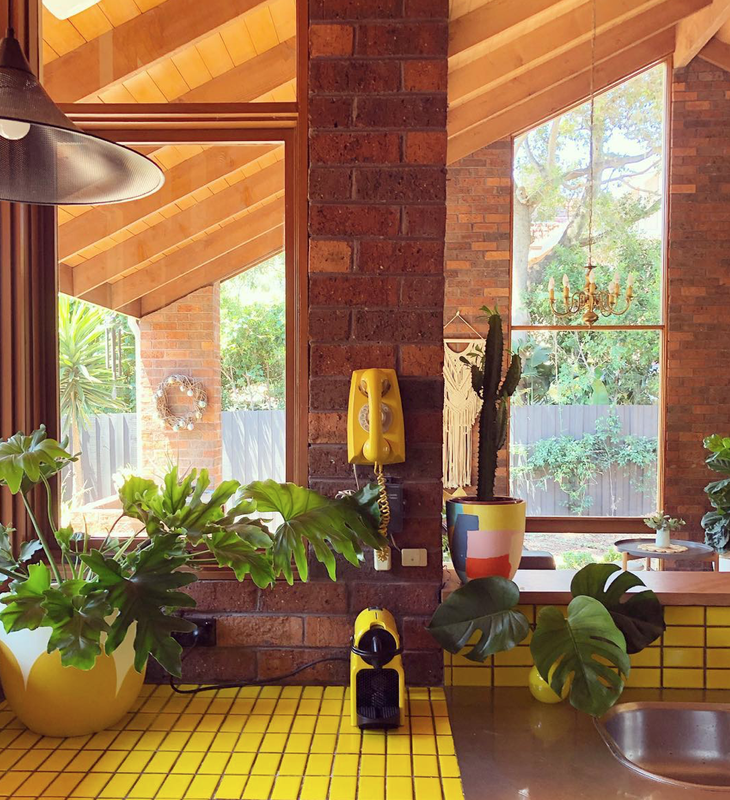 Every time someone sends me photos of their home to feature I get excited. I have a sense of what style they gravitate towards, but the full tour is like icing on the cake. Jo also lives in Ontario, only a few hours from me. Maybe in the New Year we will have the chance to meet up and go shopping together. When she shares her latest finds on her instagram account, @jmwearing, I totally feel like she is the Canadian version of Emily Henderson. When you see her home & her styled shelves you will agree with me. She's got mad thrifting skills y'all! "Holly and I recently connected this year on instagram after finding a mutual appreciation for amazing art and love of décor – bonus points for being a fellow Canadian! She asked me if I would be willing to participate in a home tour and I jumped at the idea. I have always wanted to start a blog, but am unsure if I could commit to do it, but knew this would be a really fun experience! My boyfriend and I live approximately 40 minutes north of Toronto, where we purchased our home a little over a year ago. I work in the financial sector where my creativity tends to be put on hold, so my home is where I am able to fully let it go." "One of my favourite items in this room is my framed Art Gallery of Ontario poster from 1988 of Andy Warhol’s Elvis I and II (1964), which was produced for an exhibit. I scored this off of eBay and had it professionally framed. I love this little nook as it adds a big impact when you first walk into our house because it’s one of the first things you see." "Our home was built in 1987, and is your standard cookie cutter subdivision home, which meant adding personality and character would be done through the decorating! I tend to live for everything and anything vintage or thrifted. I have no idea where this came from – I only started going to thrift stores over the past 2 years, but I haven’t been able to stop. There is something weirdly soothing about walking through the aisles of thrift stores. I love looking at items and wondering who the original owner was, why they bought the item, and how it ultimately ended up on the shelf in front of me." "I have, and continue, to struggle with our ‘L’ shape layout combo of living and dining room. I have a feeling this room will always be changing. The way I accumulate items means I never know what I’m going to come home with and what will change. I always thought our home would be exploding with colour, but I seem to have shifted to a very neutral palette." This unique coffee table was one of Jo's latest finds. I love how she layers texture into her space and adds pops of colour with greenery. Mid Century pieces are what I'm drawn to as well. This thrifted chair needed sanding & staining & looks great with updated upholstery. I just want to invite myself over for dinner. I would stare at the photography for hours! "When my boyfriend and I first started dating we took a weekend trip up to his family cottage. In the basement, was the most beautiful antique harvest table I’d ever seen. 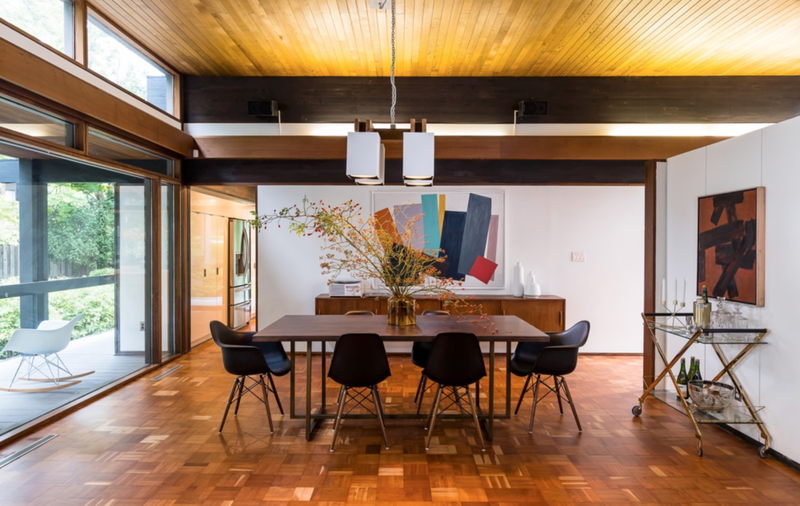 And coming from a mid century modern fan – I knew this table was something special. I remember making a mental note about how this table needed to eventually make it with us where ever we went. When we moved into our house, the universe honoured my vibes and the harvest table came with us! 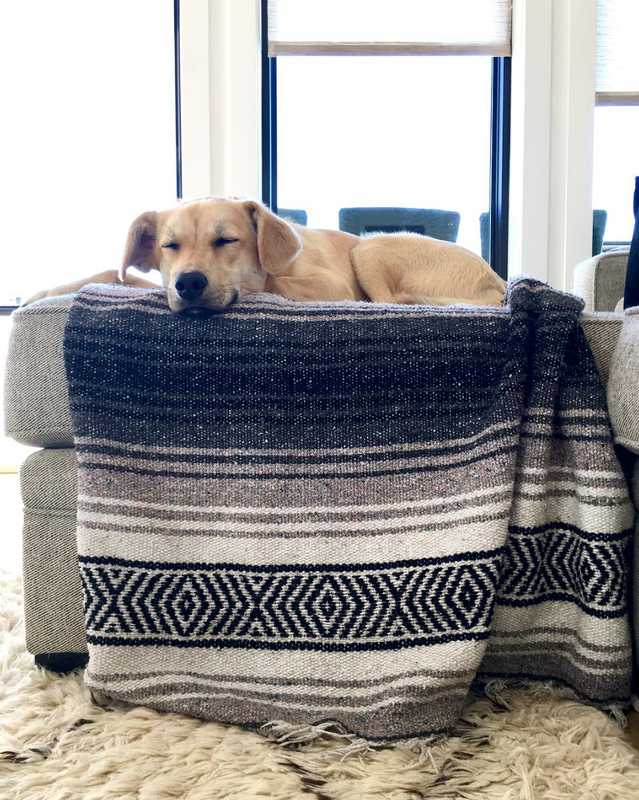 The table originally came from my boyfriends grandparents farm and is loaded with character – boards that are starting to curve and plenty of nicks and burn spots – but I wouldn’t change a thing." "I knew we needed to keep the rest of the finishes pretty modern so that the harvest table didn’t go too rustic. The eiffel chairs and industrial chandelier were easy choices. The picture shelf concept, four in total from IKEA, came from some Pinterest images I had stumbled upon. I was looking for an easy way to differentiate the space between the family room and dining room since it is one big ‘L’." "The shelves have been mostly filled with photos from thrift stores, antique shops, and eBay. My favourite of the bunch is a small black and white photo my dad took with his brownie camera of the kaleidoscope pavilion from Expo ’67 in Montreal." "Our master was one of the easier spaces to put together. Prior to us even having a house, I had a bad (…or maybe good?) habit of buying furniture and stashing it away in my parent’s basement. I think at the time everyone thought I was crazy, but I would tell them that if I loved the item I would make it work in whatever space I ended up with. Our master bedroom is a perfect example of this. The end tables ,lamps, and rug were all Kijiji and estate sale purchases that I made while we were house hunting." "And yes – we are TV in the bedroom kinda people. My dirty secret is out." "The campaign dresser is one of my favourite pieces in our home. It came from my aunt, whose grandfather or great grandfather either brought it over to Canada from England during the 1800s, or purchased it upon arrival. 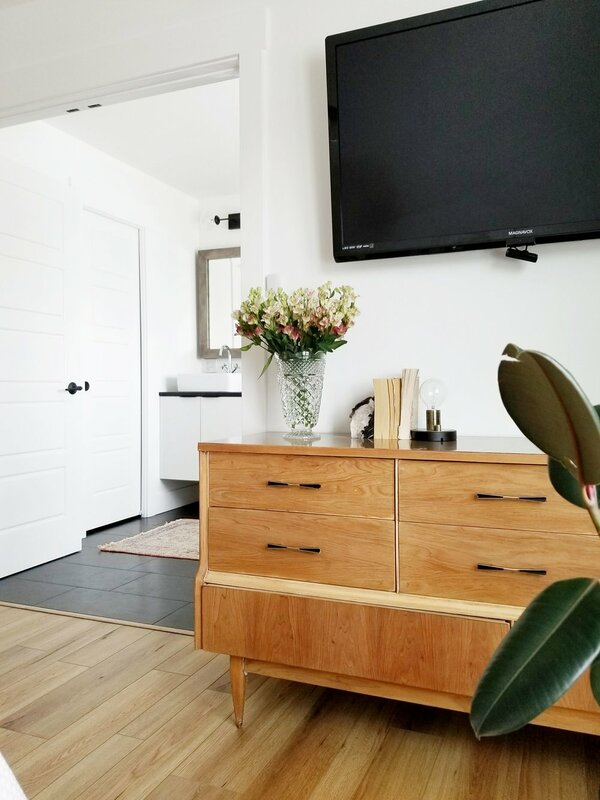 I was nervous about how it would work against the mid century vibe of the other dresser, but I think they balance each other out very well." The graphic black & white prints above the bed pop against the white wall. Someone was throwing out this plant as they thought it was dead. Jo scored it for free, as you can see it's thriving it her sunny space. 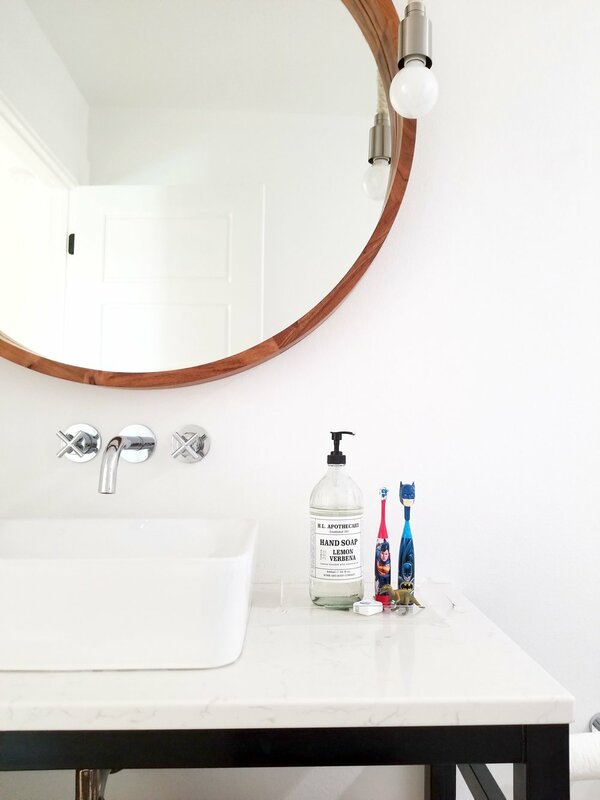 "The mid century modern dresser and mirror are vintage – my dad bought this set off of my grandparent’s best friends many, many years ago. This was in my house growing up, and was my first introduction to mid century modern furniture as far as I know. In my early 20s my parents were ready to put it out on the curb. I panicked and begged them to hold onto it. This guy ended up sitting in their garage for 5 years before we finally got our house and went to work refinishing it." How cute is that rattan rocking horse! I can't even pick my favourite piece from all these thrifted goodies, there are too many! "About a year ago, we decided the office would work really well with a wall mounted shelving system. 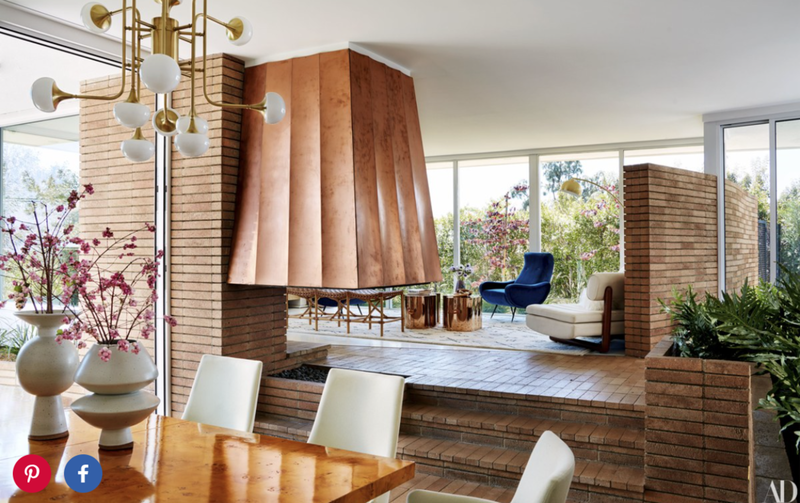 I am a mid century modern lover, and have always loved the look of wall systems/Cado set-ups. After looking for what seemed like ages, I finally came across a set off of Kijiji that worked perfectly. 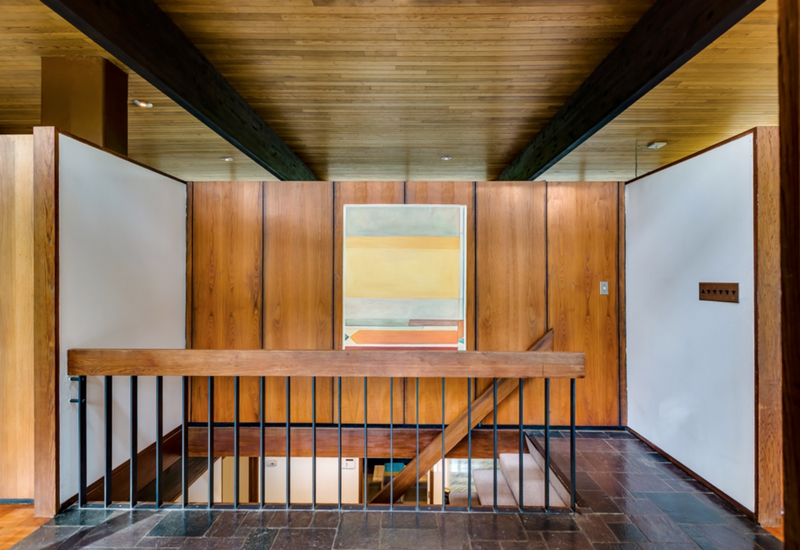 They were gorgeous solid teak that had been milled for the original owners in the 60s." The Danish monkey & that gorgeous hand are high on the list. "Fast-forward to today, after forcing black paint [Benjamin Moore Wrought Iron] on my boyfriend, and the office is complete." 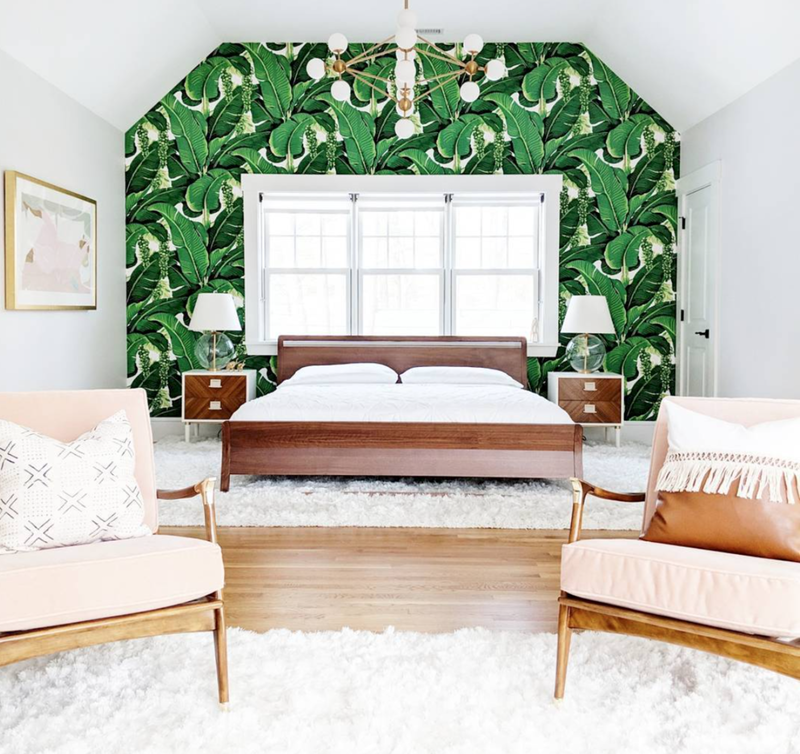 "This room really came together after I spotted the peacock rattan headboard at a local thrift store. At the time, I had a rusted out 1997 Toyota Camry and prayed this guy would fit the backseat. Once it was put up, my mind was pretty set on what I wanted in here. It has gone through several different versions, but I think the current one will stick for awhile!" I would love to be a guest in this space, how cute is the elephant! We have a lot of teak in our home, the style is timeless in my opinion. 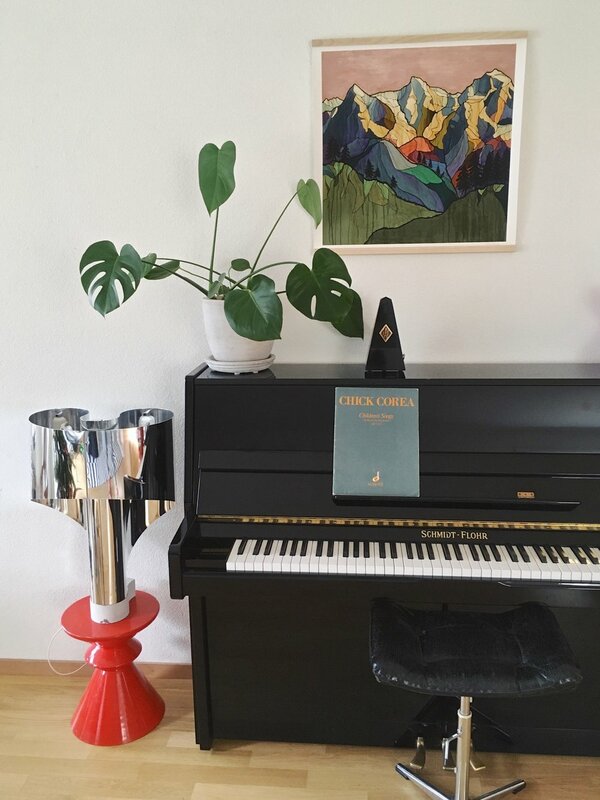 "The most recent purchases, the equipale chair and the batik, were scored at a great estate sale and I feel like they really polish off the room. 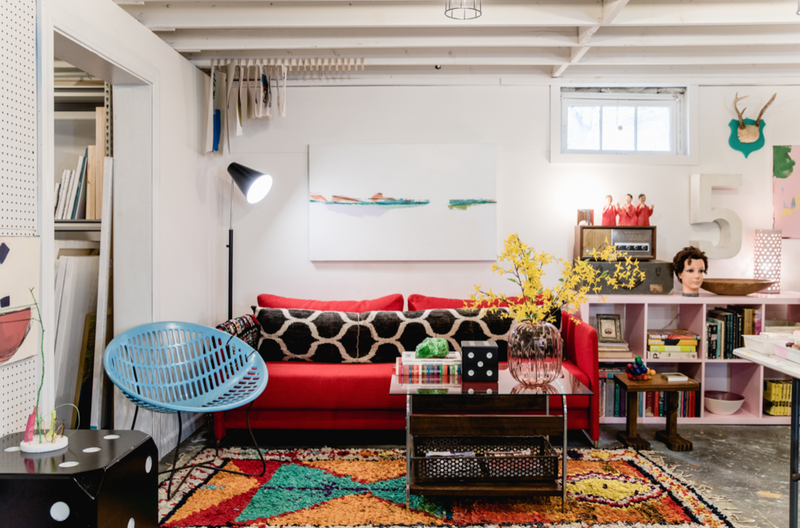 The batik adds a pop of colour that this room definitely needed but still fits with the vibe." "Our home, like many others, is a never-ending project. I’m sure you noticed our kitchen, bathroom(s) and basement didn’t make the cut this round! I’m sure we will continue working away, room-by-room, and have some updates in the future." Kim's style is the perfect example of timeless minimal design. Located in Sonoma County California, this modern home sits in the countryside on several acres. Kim and I began an online friendship a year ago, both sharing an adoration for art and interior design. Even though we have never met in person, I value her critiques and advice. Now let's dig into these stunning photos shall we! "Most people ask if he (Rob) designed our home but no. It’s a lot more modern than both our styles. It's our home for now but we hope one day we can design our own place. I would say our top styles for our home would be more rustic modern inside and out. Most likely 2 level and just a bit cozy. But you can’t have it all." The structure on the left is the main living space. To the right Kim is lucky to have this gorgeous space to create in. I'm jealous of all that natural light! The outdoor dining area acts as an extension to the main living space. A great spot for entertaining and relaxing with friends and family. One of Kim's favourite things about her home are the sliding doors that are all along one side of the house. They open it up and enjoy a fresh breeze and amazing view. Lets step inside and see the interior shall we! One of Kim's beautiful paintings is reflected in the mirror. The space is filled with warmth and texture, the neutral colour scheme allows your eye to travel from one vignette to another seamlessly. 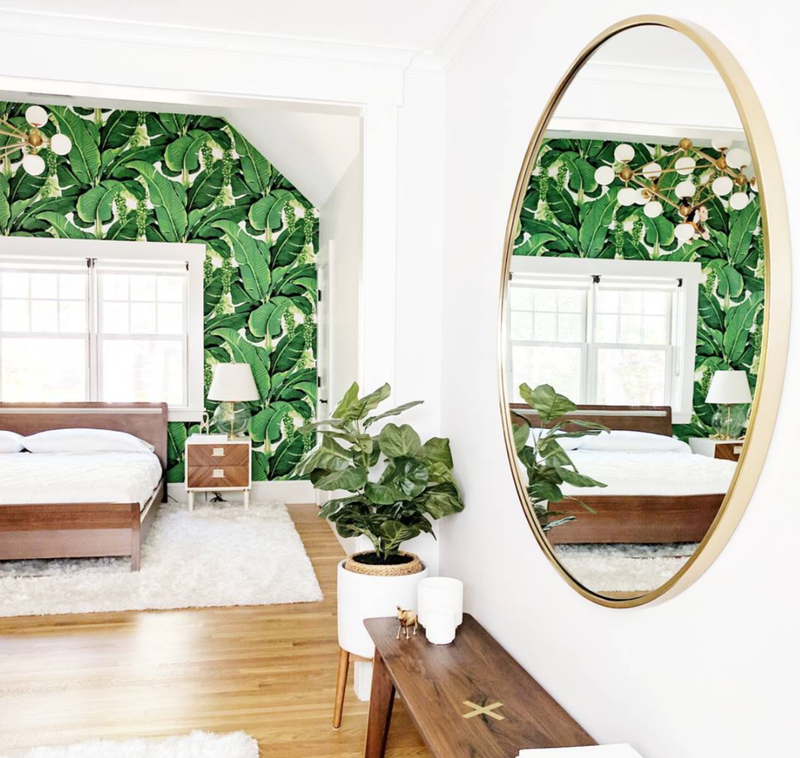 The simplicity of Kim's styling and the cacti print make this wall come to life. The addition of plants and flowers add so much to this minimal design. 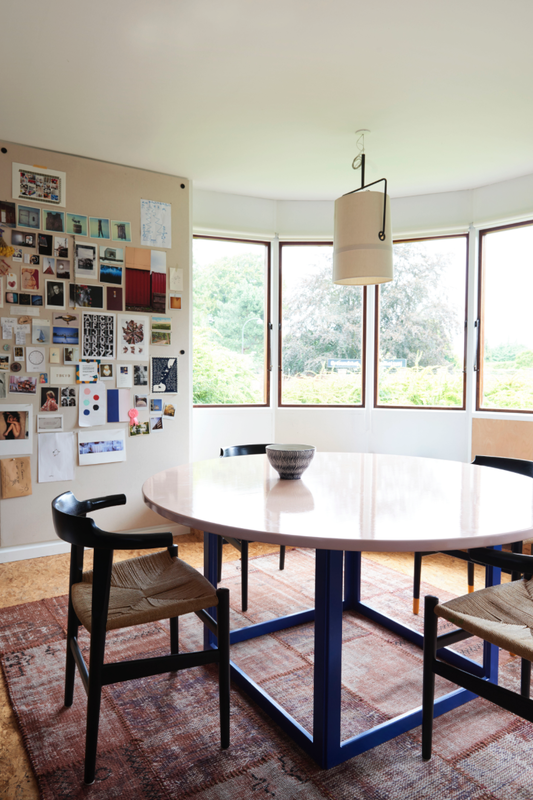 The rooms are calming and uncluttered, she is curating every piece in her home with intent. Her husband and her have designed a clean-lined space that’s still infused with meaning and character. Kim tells me that her taste five years ago was the total opposite. She is quite content living with fewer material objects and has no problem waiting to find the right pieces to add in. "Growing up I loved to decorate my room and I would decorate with so much stuff. I have changed since then and now enjoy purchasing only things I really love and keeping my home as decluttered as possible." 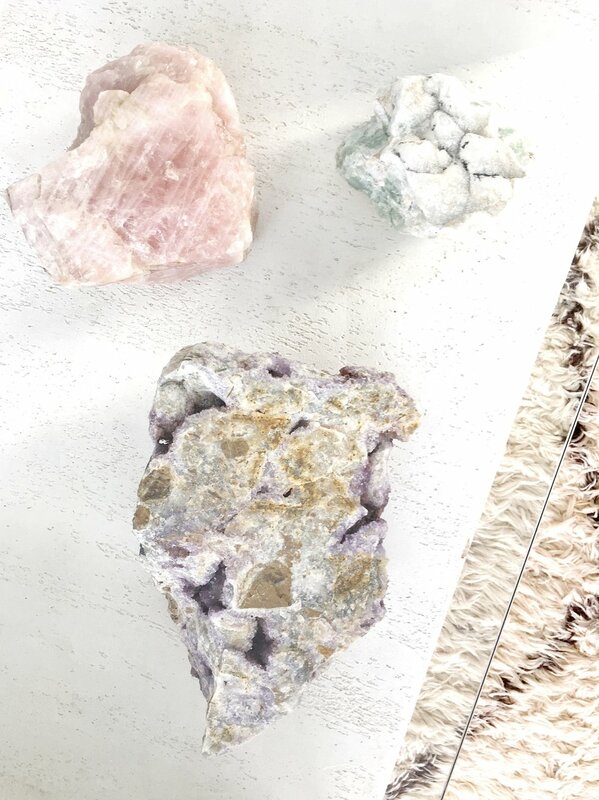 Bringing natural elements into your home is an easy and inexpensive way to add texture. The transition from one room to another is subtle. 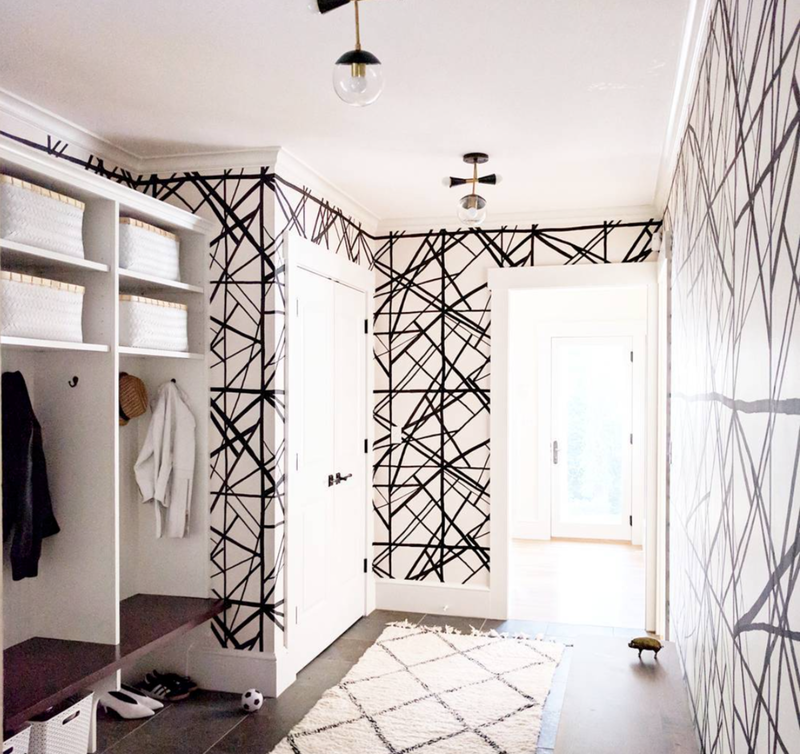 There are no bold or graphic elements from details such as wallpaper or ornate floor coverings. Allowing the floor plan to feel more open and inviting. The family dog Ollie gets comfy on the slipcovered sofa. "I do have several items I would like to add to our home. 1. An overhead light for our dining table 2. We still need 2 more dining chairs 3. More light fixtures — love Schoolhouse fixtures 4. Cowhide rug for dining room. It’s nice to know it doesn’t have to all get done at once though. I like making a home come together over time. It really makes it feel more special. Not like you just went to West Elm or Crate & Barrel and just bought it all." The kitchen is functional and stylish with a neutral palette. A single bloom adds the perfect pop of colour. 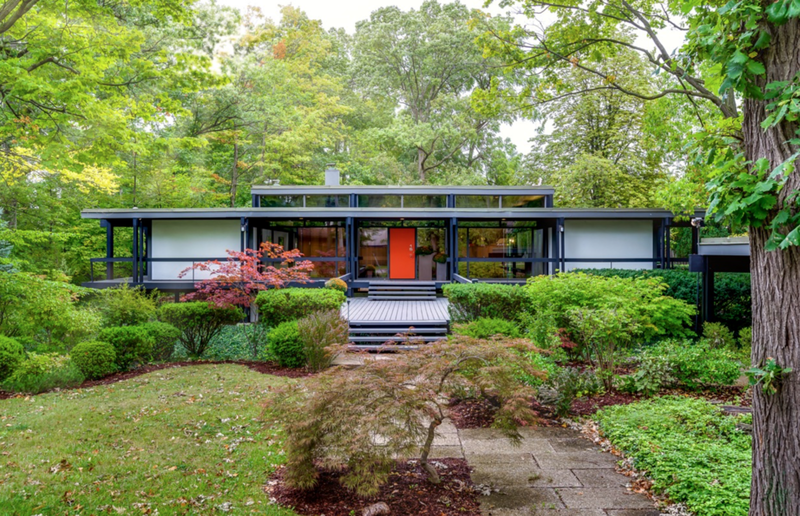 "I enjoy many styles of decorating and right now my home is just more modern. My main goal is to add a couple decor antique pieces + some items when we go to New Mexico in September. I am really loving that ethnic feel. I want to add a touch of both of these." Layered textiles help add that coziness Kim loves. A peak into Kim's private work studio. Her inspiration wall is filled with inspirational photos and quotes. A relaxing spot to sit, enjoy a cup of tea and enjoy the sunshine. Just looking at her surroundings allows me to feel a tranquility and ease that is hard to describe. My taste is quite the opposite of Kim's. 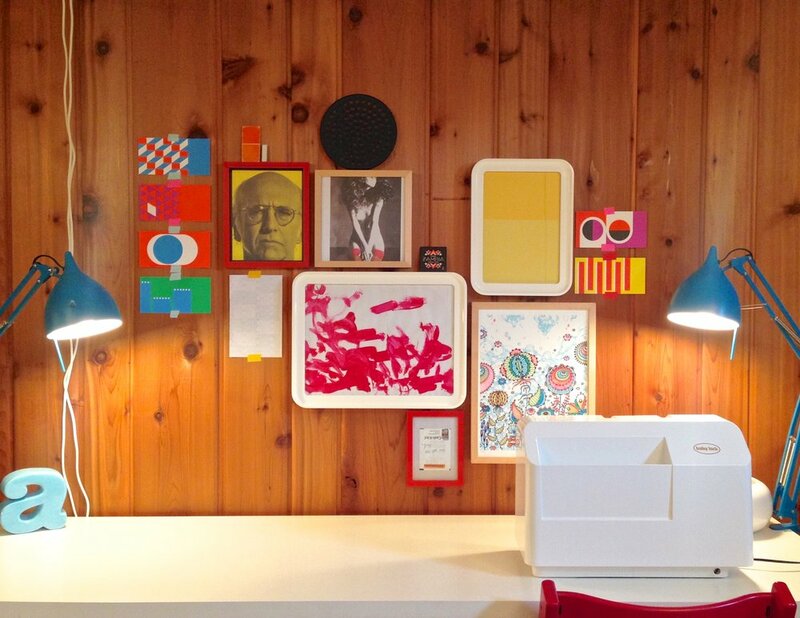 I love colour, pattern and lots of collectibles. When I opened up her email and saw the photos of her home I was blown away. I wish I could live in a home like this and surround myself in nature. I can't wait to one day come and visit in person.